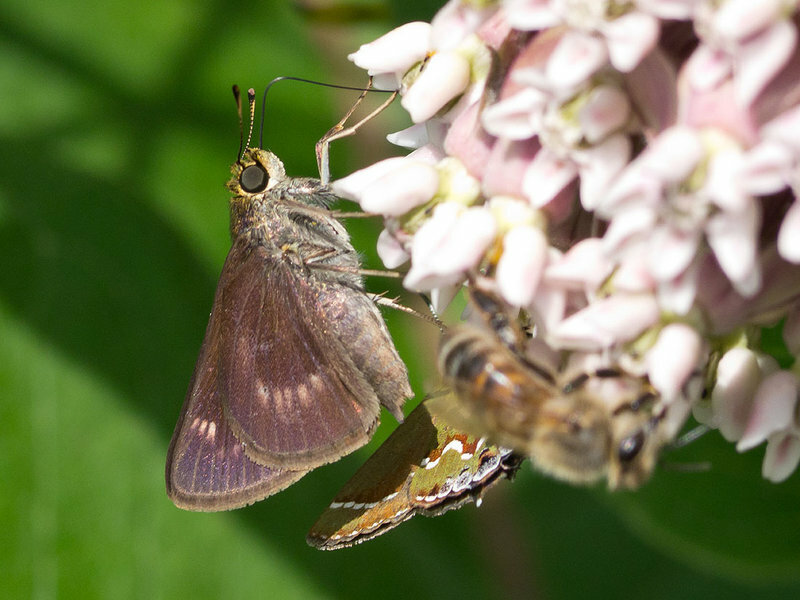 There is still little milkweed in flower as can be witnessed by the Two-spotted Skipper having to take nectar from Timothy. 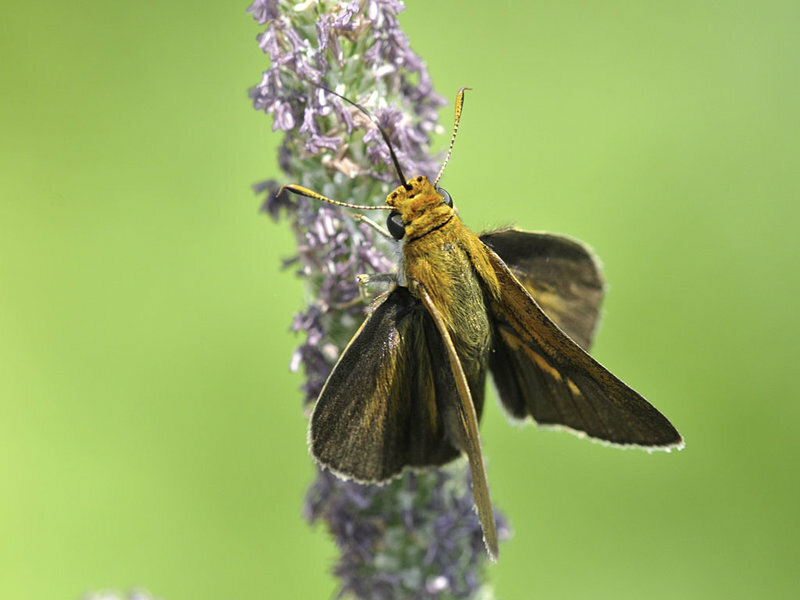 The photos are of a male & female Mardon Skipper. Warm, sunny day. 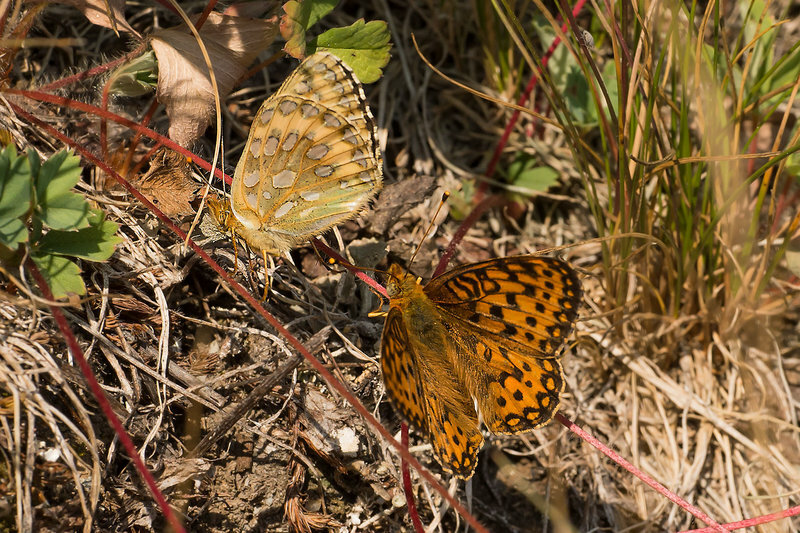 The Regal Fritillaries we encountered were hiding down in the grass, not feeding on the butterfly milkweed or common milkweed that were in bloom. 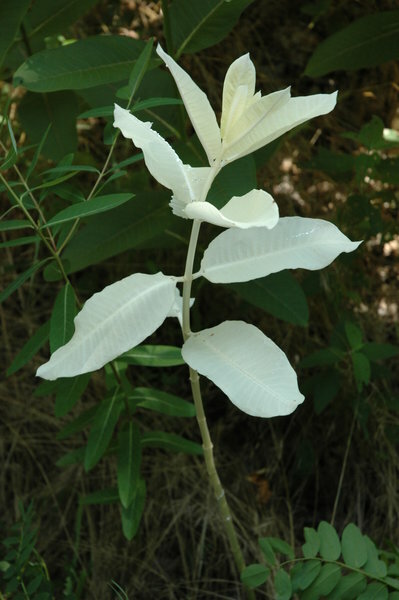 We were amazed to see the all-white common milkweed! Sightings from open public walk. Abundant Common Milkweed, but little activity. Obs. made during the hottest part of the afternoon. Kittatinny Valley S.P. along Limecrest Rd. 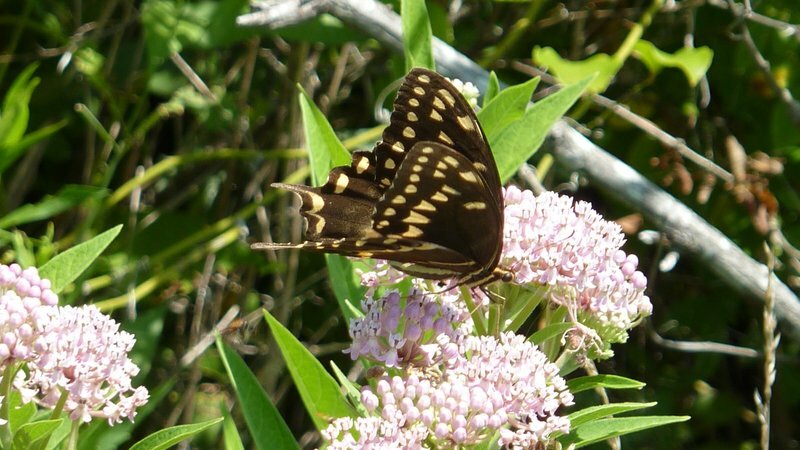 Abundant nectar, including Asclepias tuberosa. my first visit to another spot veteran butterflyers say is a shadow of its former self. the county has no money to mow/maintain the large field at the end of the trail- vegetation is chest high. 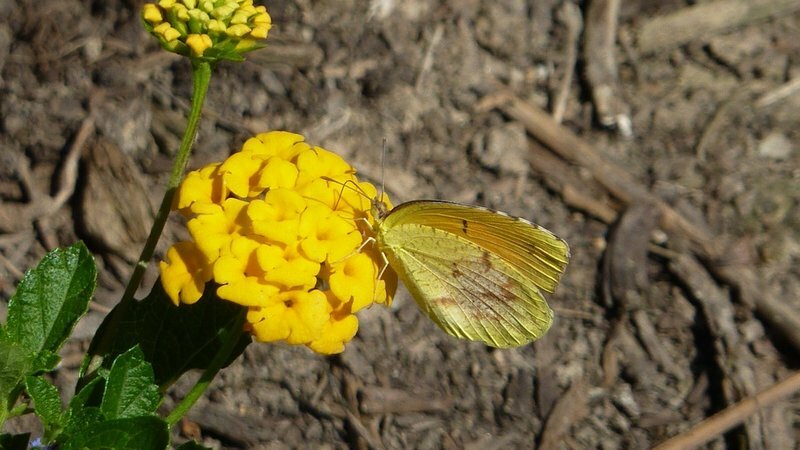 and apparently has crowded out larval host plants over the yrs.it was pretty- hundereds of orange milkweeds in bloom, along with common milkweed, dogbane,, black eyed susan etc and nary a butterfly on them from 10-1130AM..it was hot but not too hot to preclude butterfly activitiy. wood nymphs were definitely staying low in the ground cover to avoid the sun. 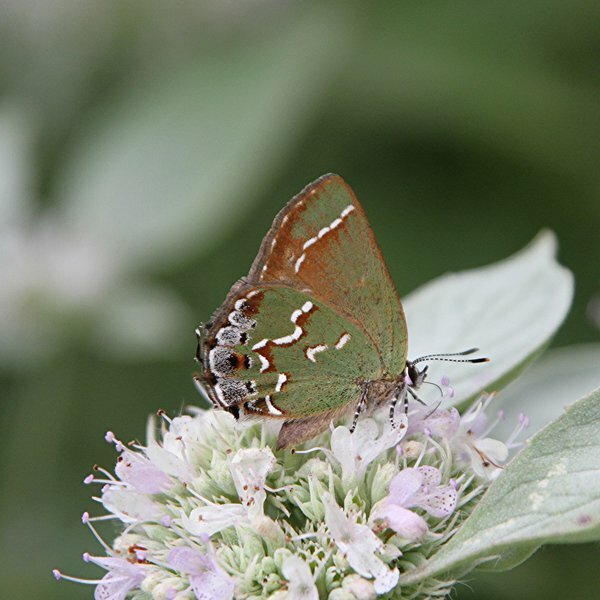 Closely observed each Banded Hairstreak, looking for Hickory. All Banded Hairstreaks ecept for one were nectaring on Common Milkweed. The one exception was Queen Anne’s Lace. Last stop of the day. Obs. made between 4:15 and 5:40 p.m.
FR295 merges into Road 3 going into Bethea S. F.
Parts of Eddy Grade Rd. and Road 10. One leg of the Rockland Co. Fourth of July count. Posted here as well because of the 76 Appalachian Browns. A record? Condition ranged from very worn to very fresh. Hour-and-a-half walk, 10–11:30 a.m. Already hot & humid. Part of the 30th Northern Westchester 4th of July Count. 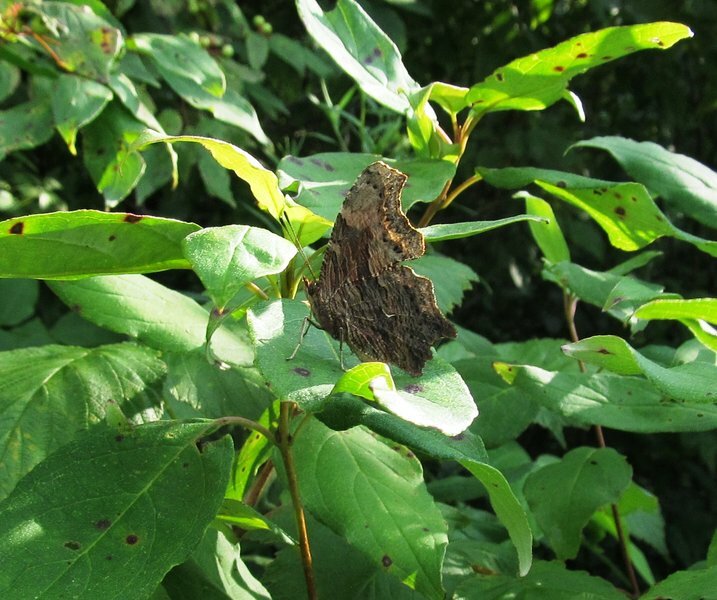 Dion Skippers are seen on about 1/3 of the counts, but this is the first individual seen in the Chappaqua sector. 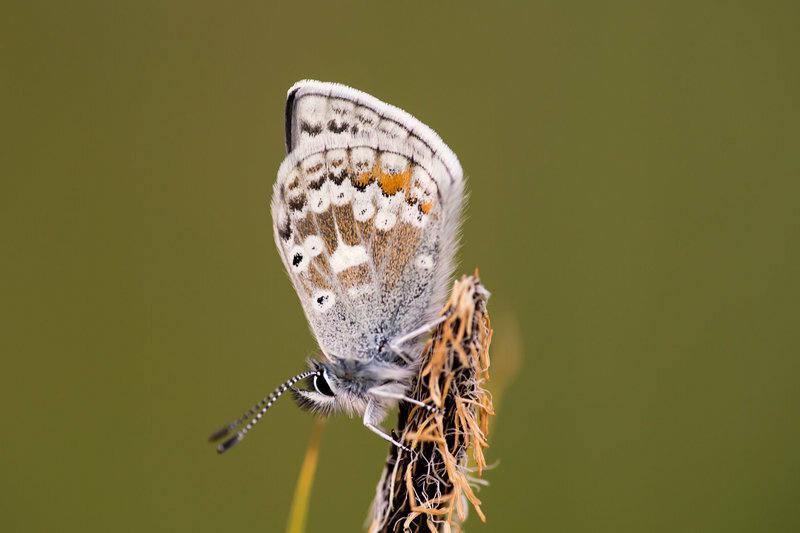 Habitat: Roadsides and openings through very hilly mature woods. Cloudy day — sun only came out for about 10 minutes towards the end of the trail. 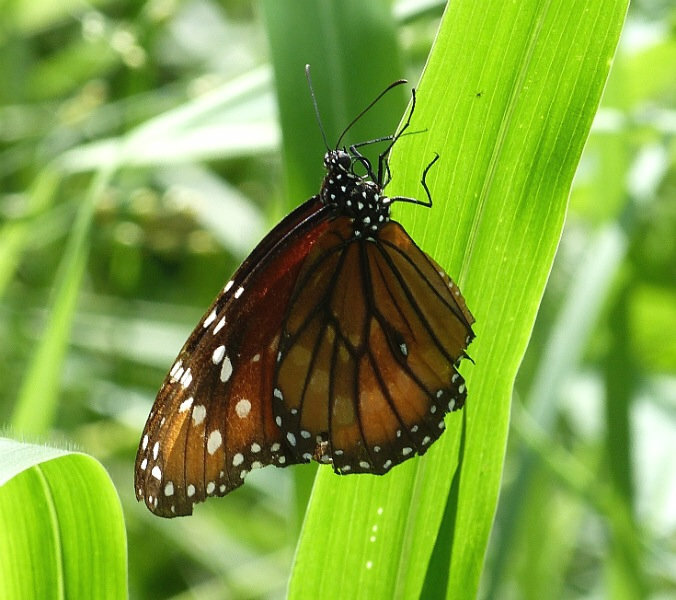 FOS monarch for me in NY, at the far/back end of the field; unfortunately our family oriented monarch butterfly walk had already ended early due to heat after 45 mins, with no monarchs up til then despite plenty of milkweed blooms. What a wonderful treat! 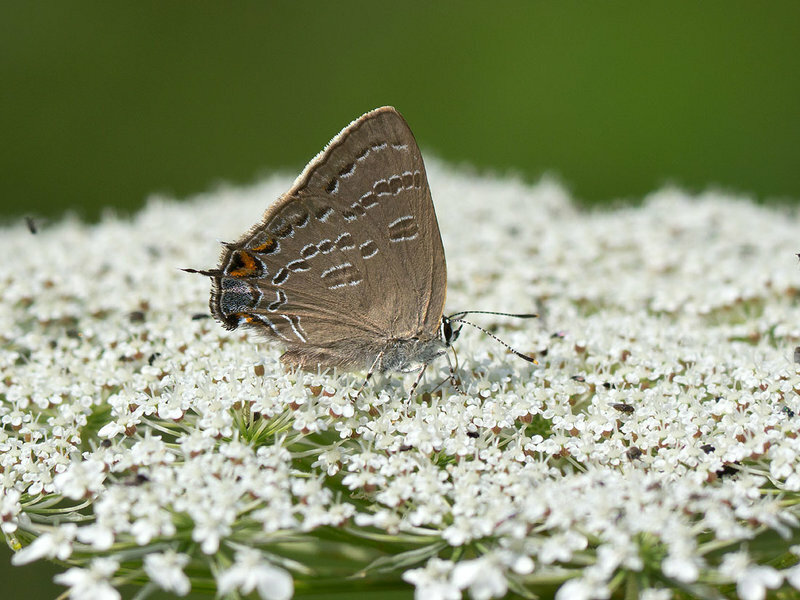 In all my years of butterflying, I have never had any luck with Hairstreaks in west Michigan. 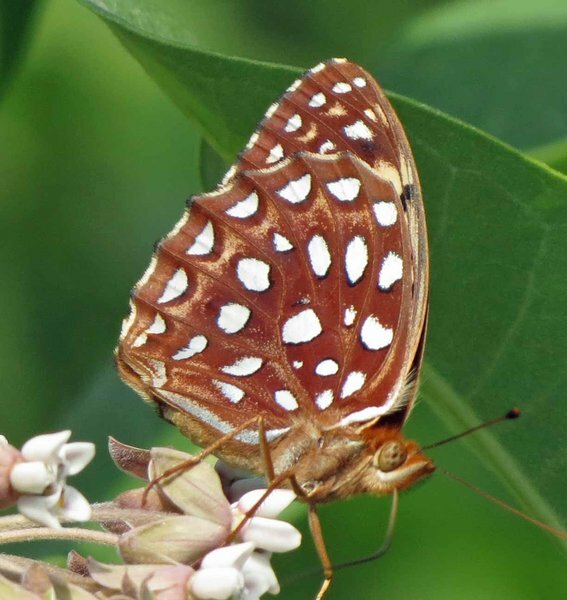 The other day I was watching a Great Spangled Fritillary and I happened to see a little butterfly land on a branch not to far away. 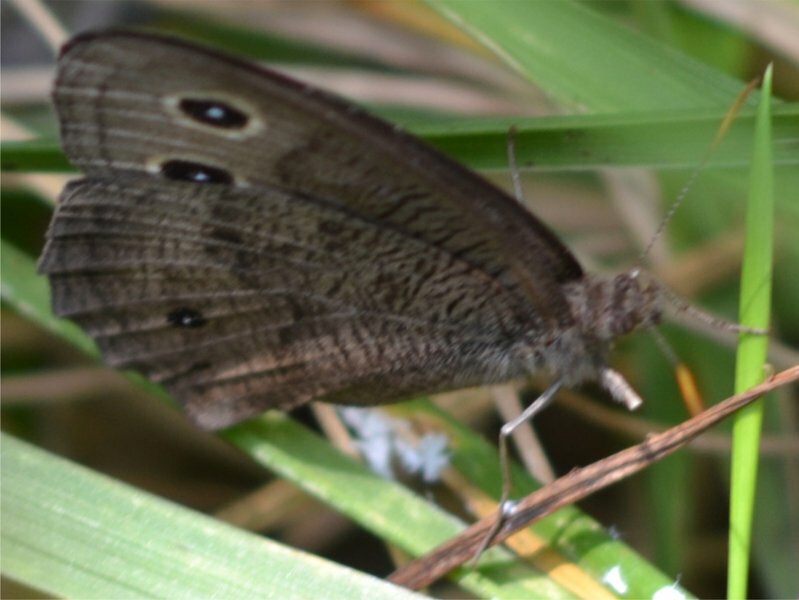 I was more than excited to see once I got a bit closer that it was a Striped Hairstreak. This is a rather rare find in Michigan and I was very happy to see it! 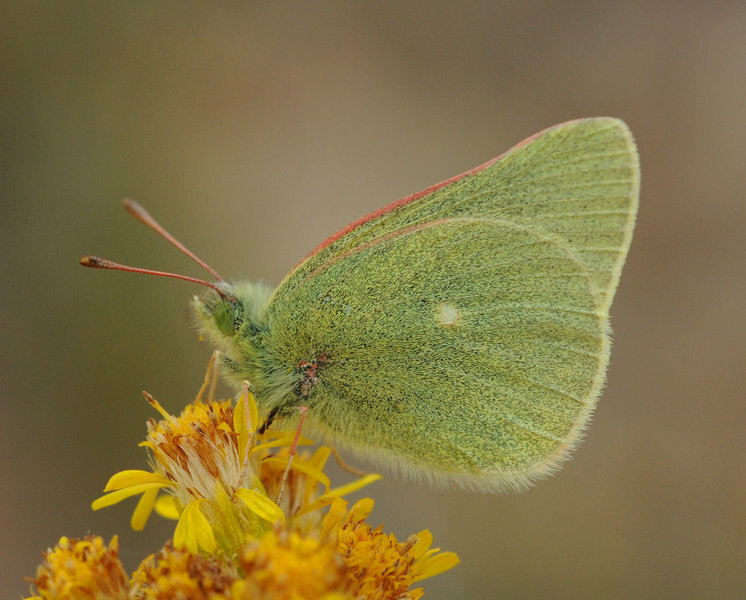 Best day of the season to count butterflies. The Harvester was a nice addition to the days count. 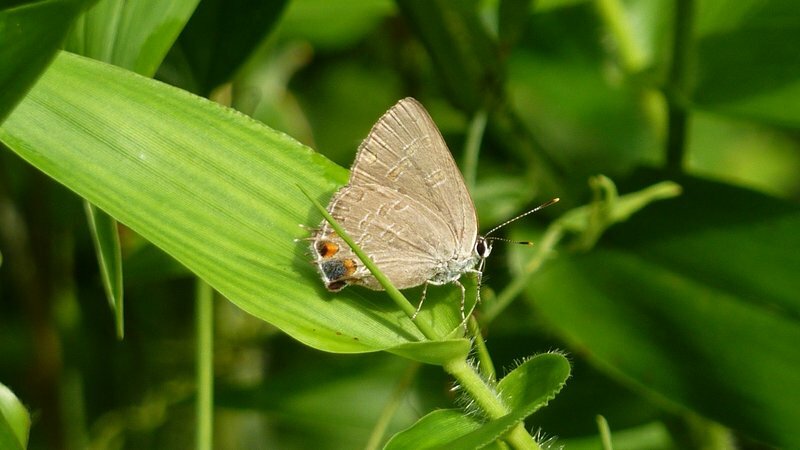 First Hickory Hairstreak seen at this location. I was out walking the dog this evening in an area out behind my house. Sandy, overgrown, weedy area adjacent to a corn field. It was about 7:30 PM . 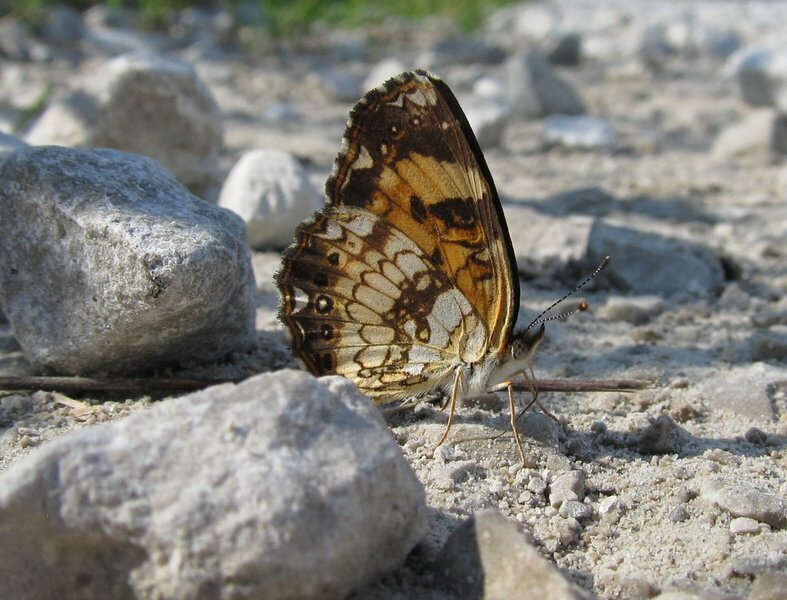 A Variegated Fritillary came out of the weeds and landed on the ground in front of me. 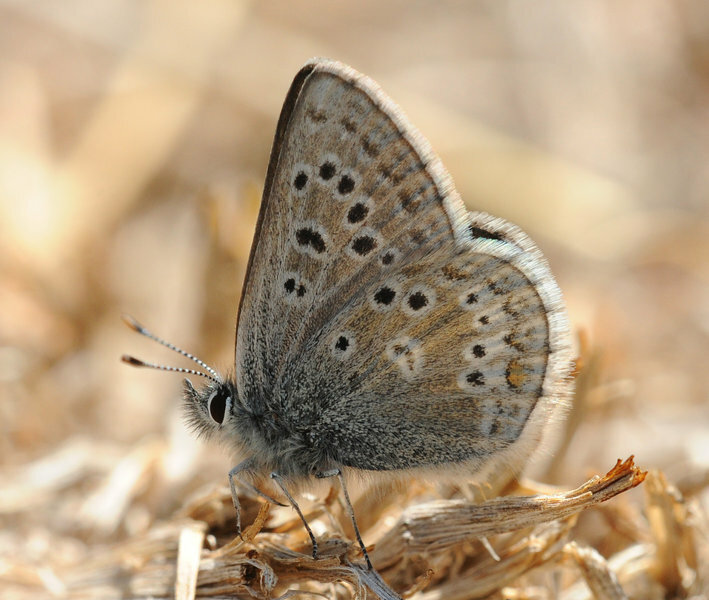 hairstreak counts like a football score= good butterflying. 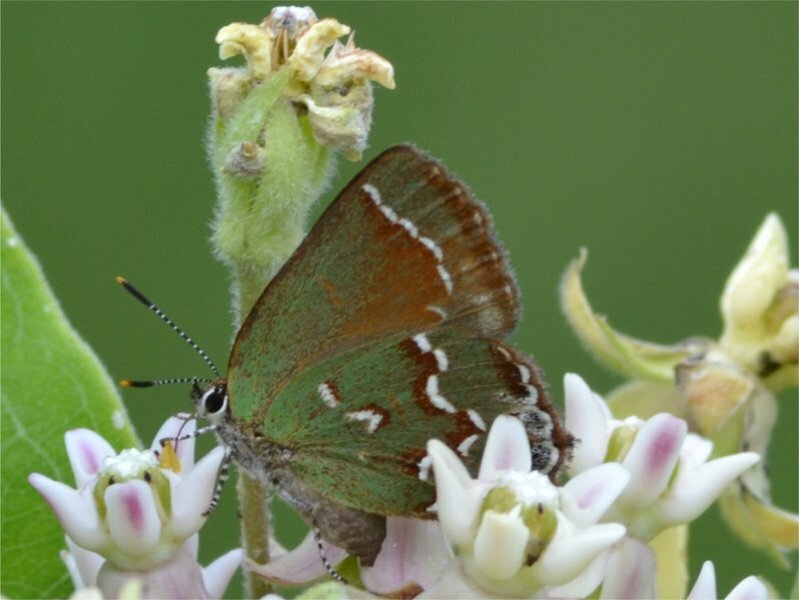 observed from 730-1030am, all coral hairstreaks except 1 were on orange milkweed, one small Asclepias plant had nine hairstreaks on it. 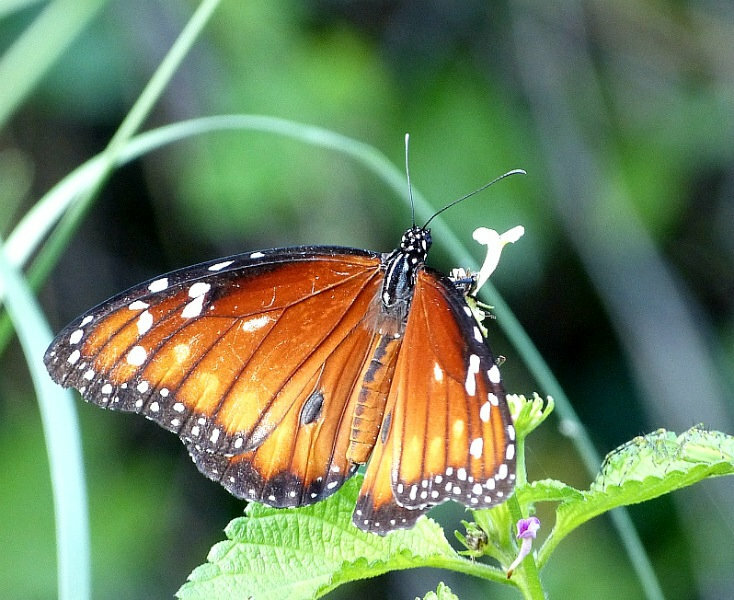 still very few brushfoots, no monarchs, despite ample milkweed and other blooms. Most FR roads driven had to turn around due to flooding. Parts of FR287, 289, 291, 274, 281, 237, 234, 218, 272, 285, 262A, 262, 236, and 233. 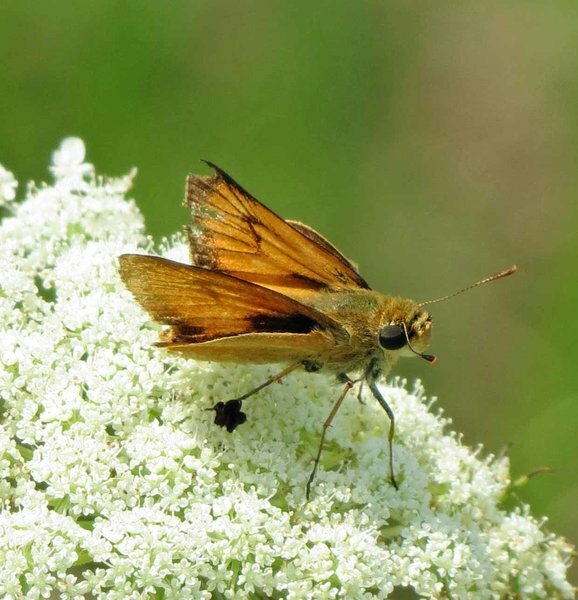 Several areas of observation included about 20 Palamedes mineralizing on the FR and flanked by Carolina Redroot in bloom on either side of the FR where dozens and dozens more were nectaring. Numbers very low. Too much Mugwort. A fun survey day with Buck Cooper, Dave Cutler, Sue Farnsworth. Lots of nectar choices but favorite was Pluchea. Photos of 2 of the Arogos Skippers. beautiful day after a long period of rain. This time in July can be explosive here. Duns and Little Glassywings were too abundant to count. 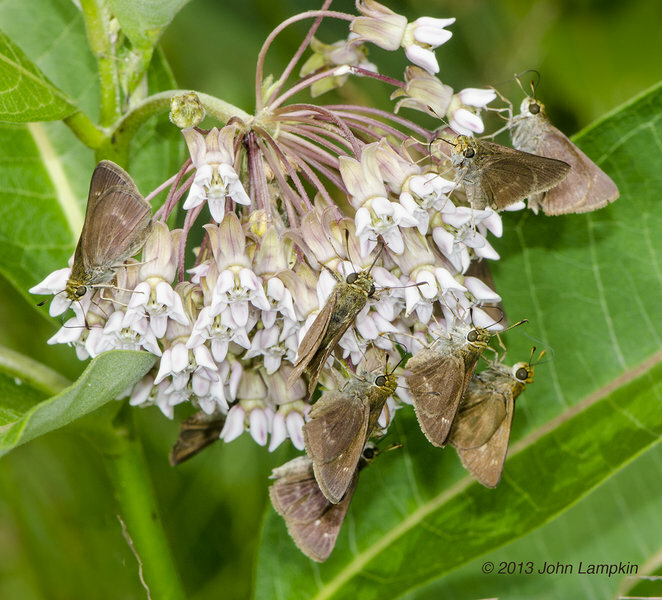 In a mile-long roadside strip, many milkweed flower heads carried ten or more skippers. Between 1-3pm, 80 degrees, mostly cloudy with light winds. 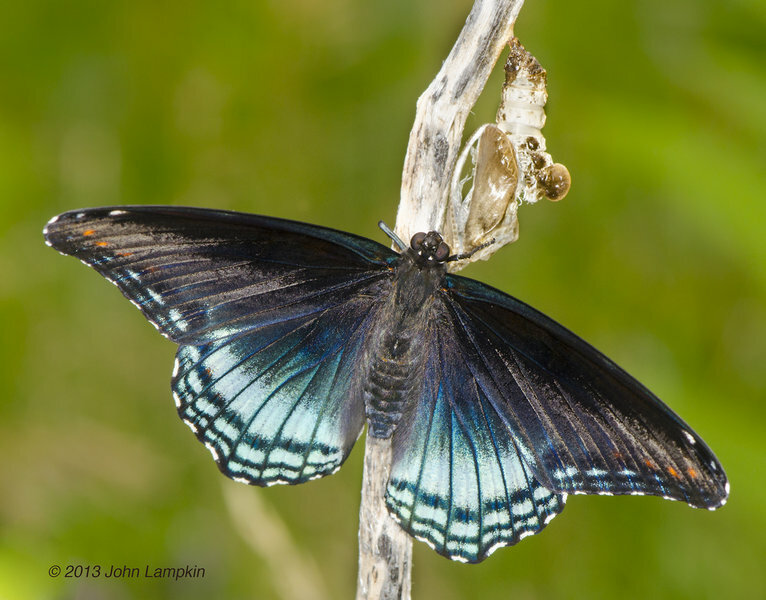 3 E. Tiger Swallowtails, Giant Swallowtail and Red-spotted Purple were puddling in launch area. 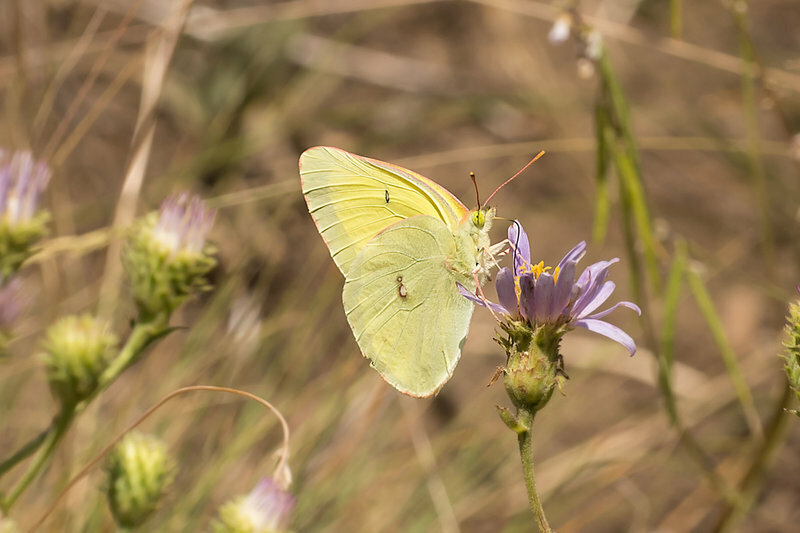 Sighting also included 1 UnID’d small sulphur. Sawtooth Ridge at the south end of Caribou Lake at 6,841 ft. in the Trinity Alps. 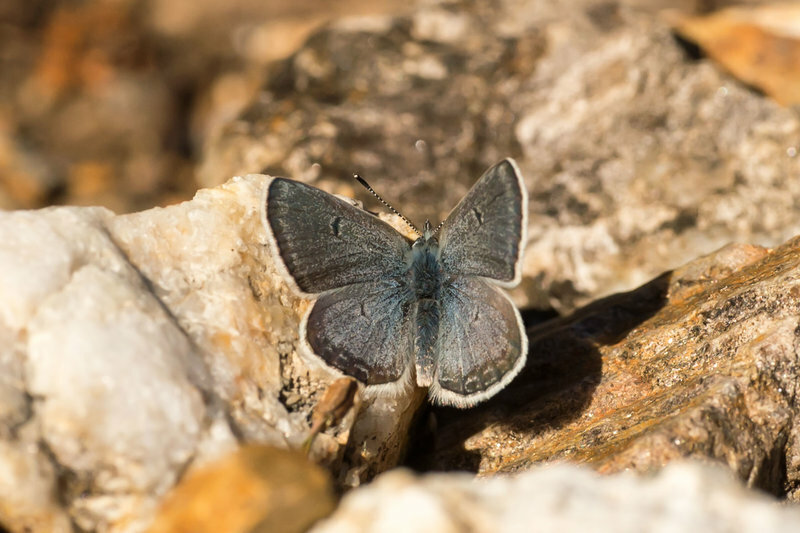 Found 2 fresh Heather Blues among the “Sierra” Arctic Blues. Incredibly beautiful area as a bonus for the long trek in. One of two trips I have been leading at Plainsboro Preserve - this is the third year. Twelve people joined me today. I did some preliminary scouting around 8:45 am, met the group around 9 and was in the field by 9:15 am. We checked various areas until around 11:45, with some folks leaving early due to the humidity and heat. 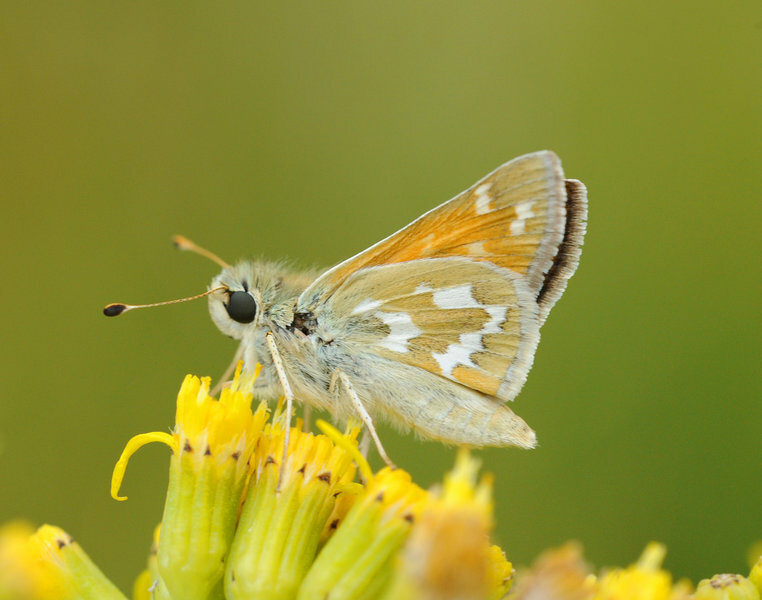 Eleven species is a decent trip - especially this year when it seems most species are a bit off (especially skippers). This is the Kissimmee Prairie Sanctuary NABA count and takes place inside the state park. Area is extremely wet from above average rainfall beginning in May. 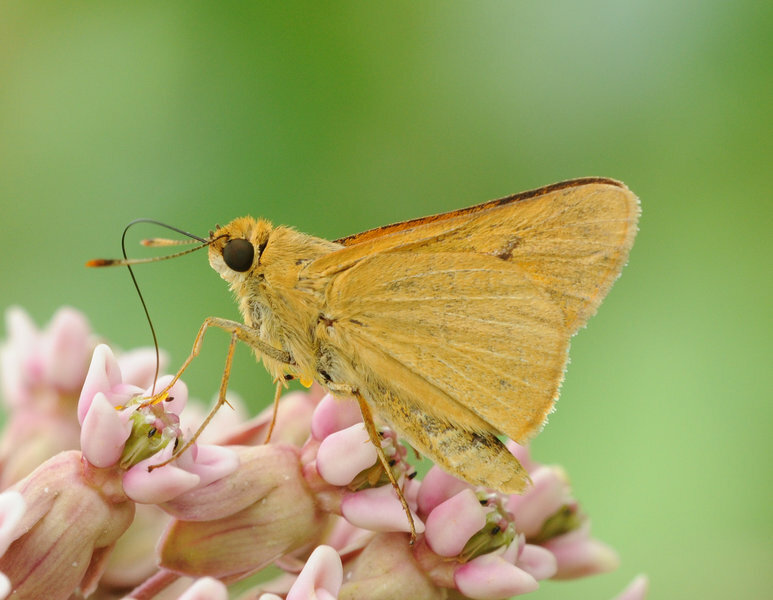 Heavy rains at 2:30 p.m. brought the count to a stop but not before we got some quality skippers on the list including this photo of Palmetto Skipper. Ten participants on the count. Sightings from the Seven Devils count of July 13. This is not the official list. 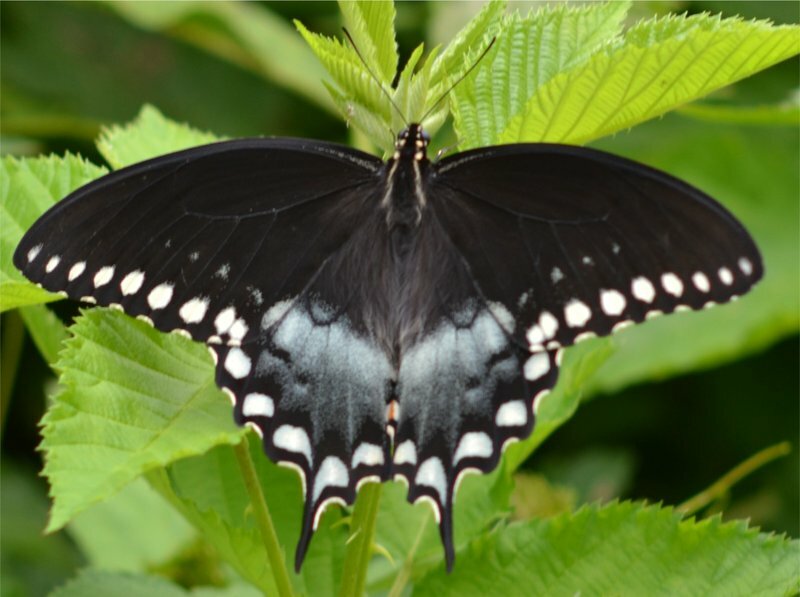 The highest number of Eastern Tiger, Black and Spicebush Swallowtails I have ever seen in one location for Westchester County - largely feeding on Milkweed in this pristine meadow adjacent to a fenced in farm. 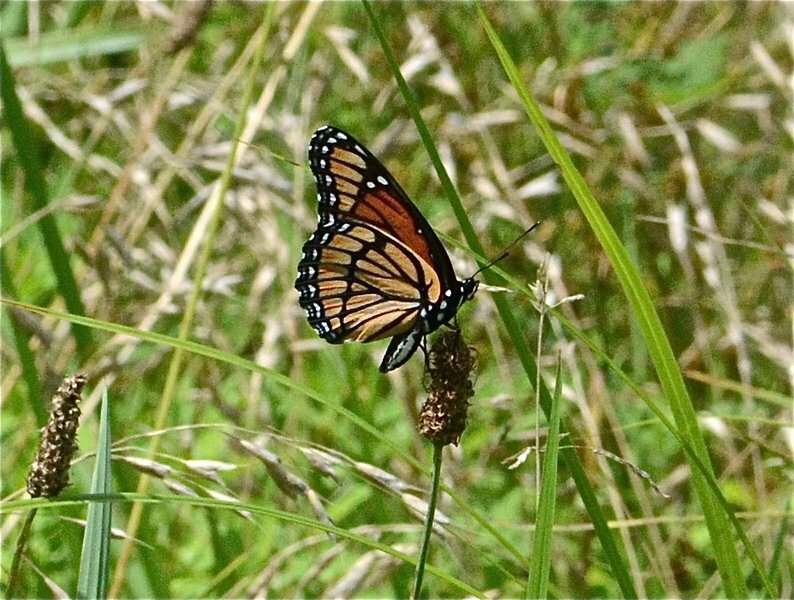 First Monarch seen at this location for 2013. Weather: 85-83 °F, mostly sunny, ESE winds largely blocked by hilly terrain. Habitat: varied, including mesic prairie, mowed paths, oak-hickory groves, savanna, scrub-shrub, streamside woods, and constructed wetlands. Notes: Minimum of 11 Striped Hairstreaks, including moderately worn males vigorously defending patches of hawthorns on sunny hillsides. 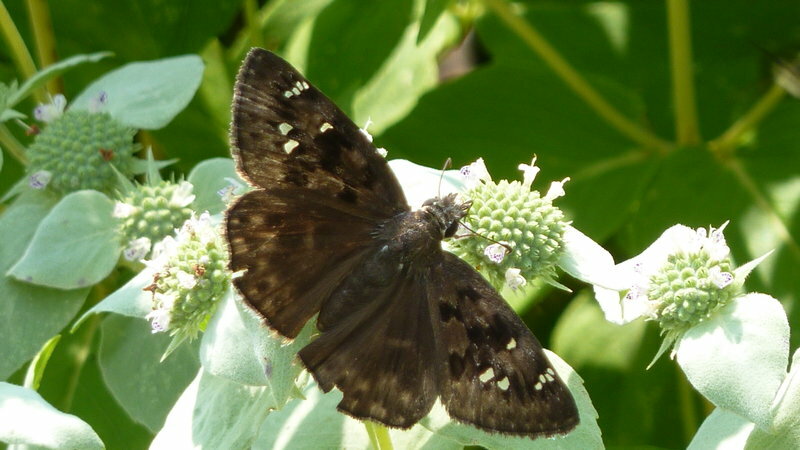 Fresher-looking individuals were basking/resting down low in various shrubs (e.g., dogwoods). 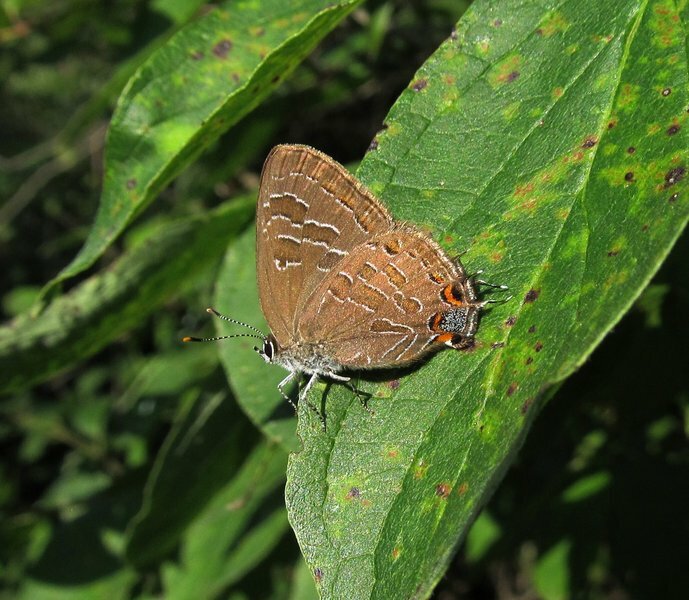 Edwards’ Hairstreaks were perching at a traditional hilltop along Bur Oak savanna. 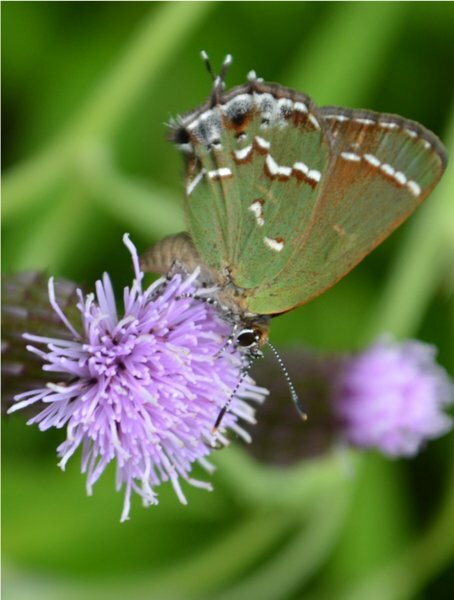 Coral Hairstreaks were around clumps of Black Cherry and American Plum. 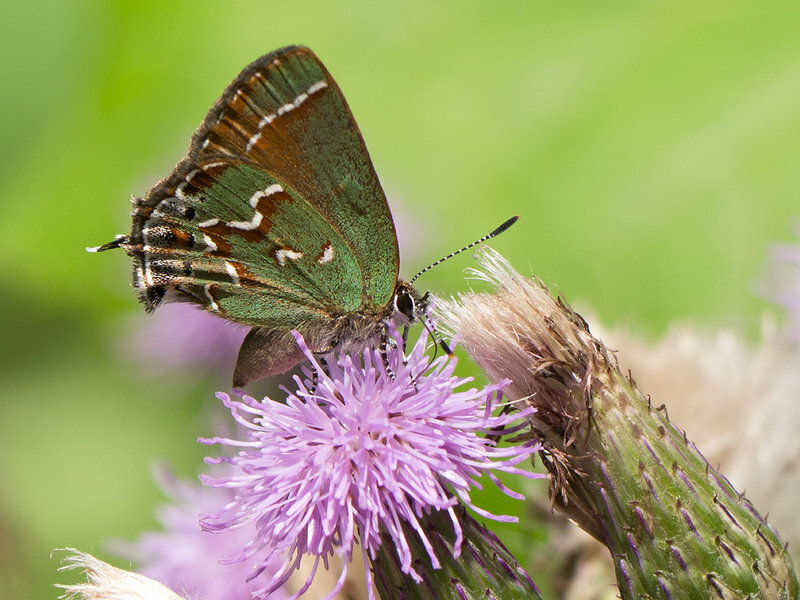 Banded Hairstreaks were scattered nearly throughout the wooded habitats, but mostly by walnuts and oaks. 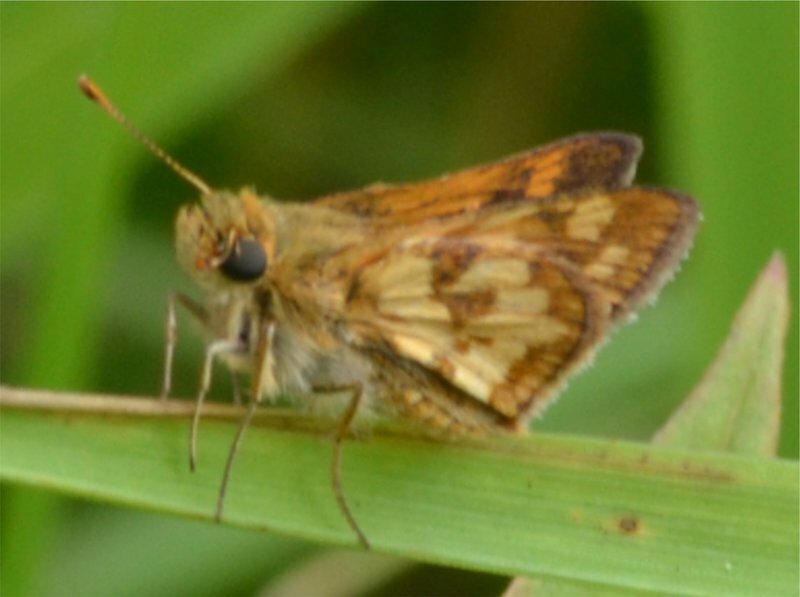 Regarding skippers on this visit, I did not find Dion Skipper at a wetland that held 13+ here in July of 2011. 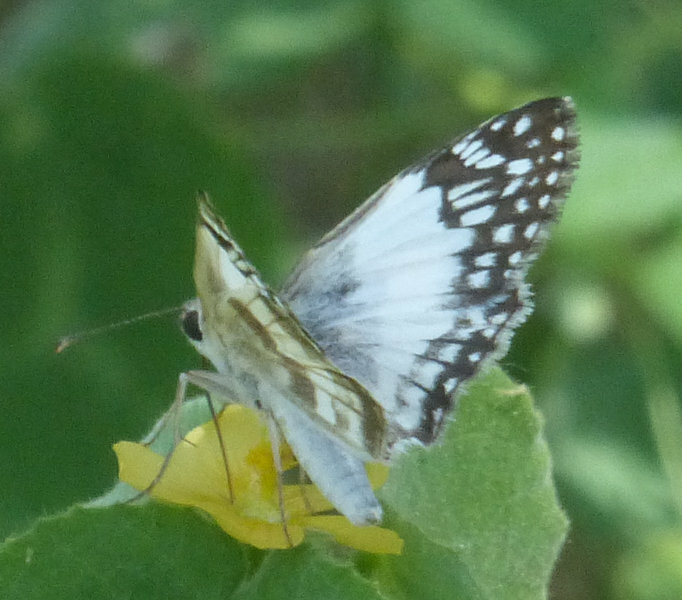 All were nectaring on flowers, except for the White Admirals. 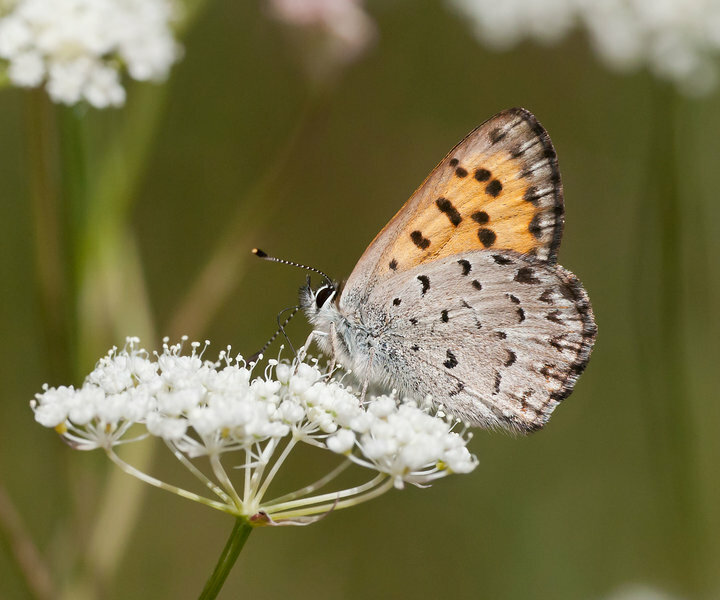 I hiked up to Heart Lake to the blueberry bogs to photograph Mariposa Coppers. I saw quite a few and probably the most at this site. My timing was perfect. 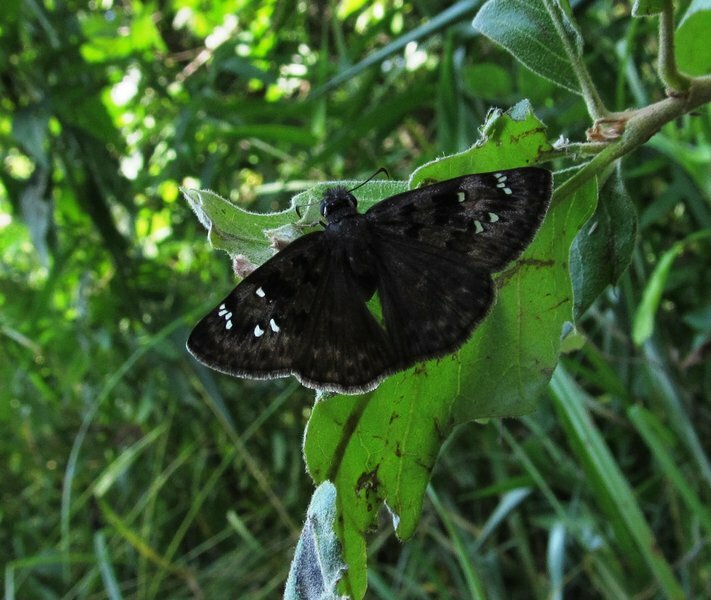 Also had several small dark skippers I didn’t id. 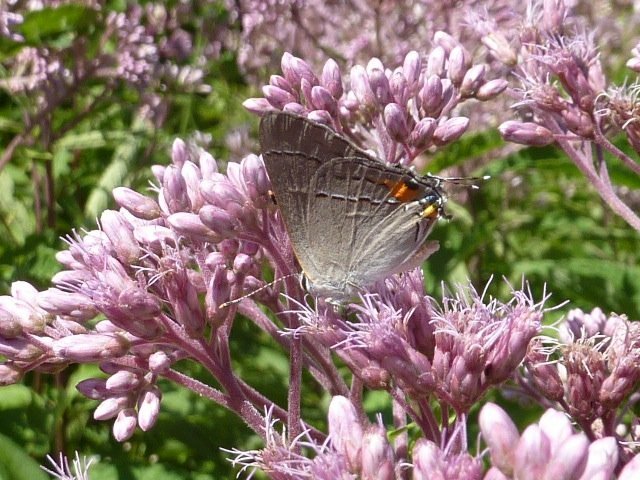 All of the Hairstreaks were on Common Milkweed. Most of the Bog Coppers were well worn. Cranberries still in bloom. List of species I personally saw on the Yellow Pine count of July 8. This is not the official list. I walked the outer grounds of the preserve as well as a quick trip inside the gate as far as the pond from 4:00pm to 5:45 pm. 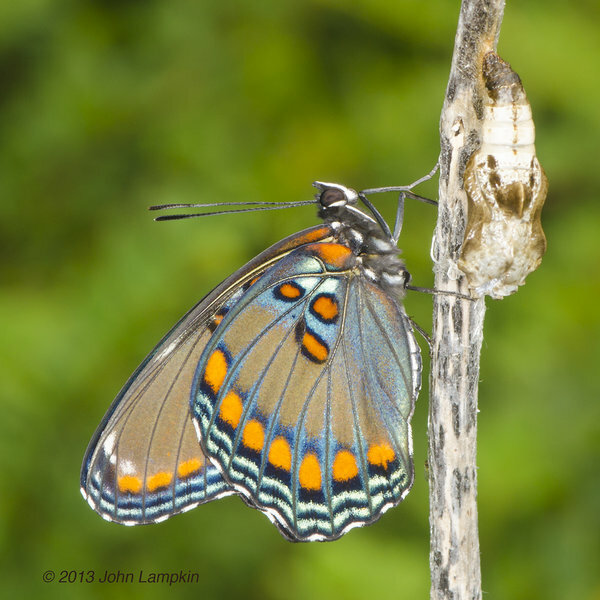 The earlier dearth of Eastern tiger-swallowtails appears to have finally been overcome by the second brood. I also had 3 Sleepy oranges, which seem to appear here yearly, though nowhere else in the area. There was a good diversity of species, just in time for the annual count on Saturday. 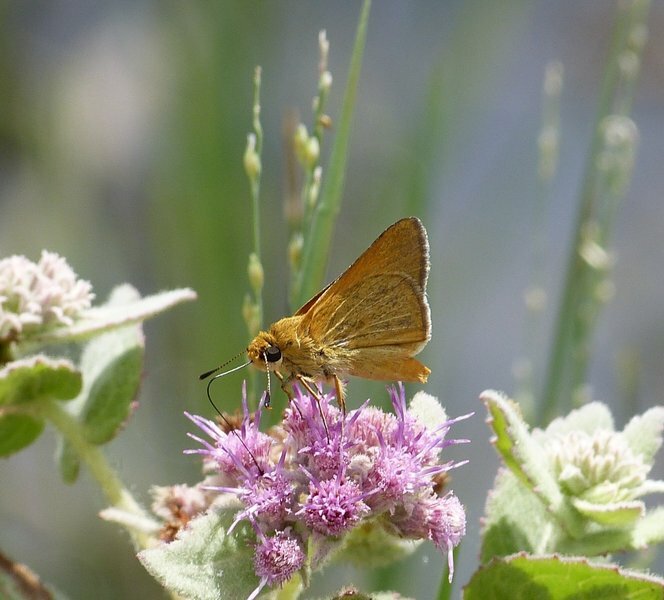 Sightings from the Boise Front count of July 7. List is not the official count list, just the species I personally saw. This is part of the Walk in Water NABA count. Lots of areas in park too wet to access. Two Florida Cottonmouths added excitement to our part of the count. Linda Cooper, Buck Cooper, Jim DuBois. Photographed near the trail head for the Peak Trail to climb Mt Lassen. Milkweed still in bloom and sweet pepperbush just starting to bloom. 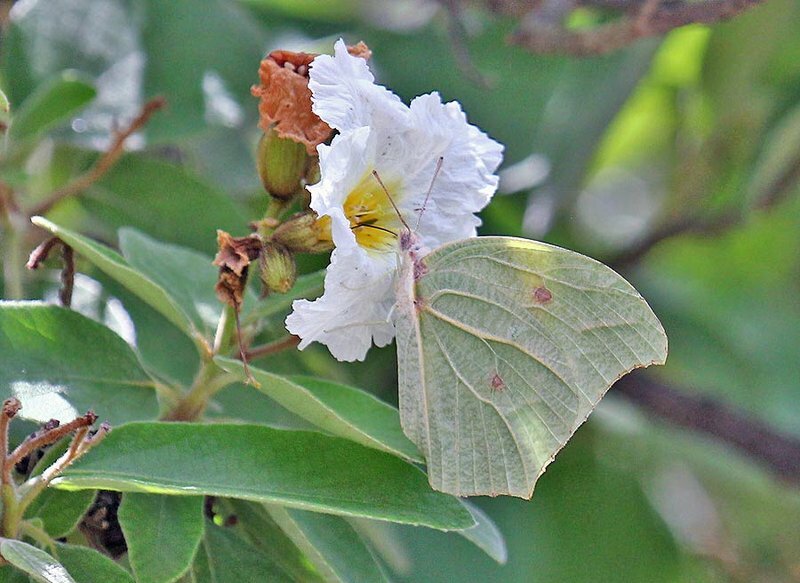 99 degrees & humid, but butterfly garden was very active. Fresh brood of silvery checkspots. Midday, hot (96F.) and humid, mostly sunny. Two hours in the field with visiting Steven Rosenthal. 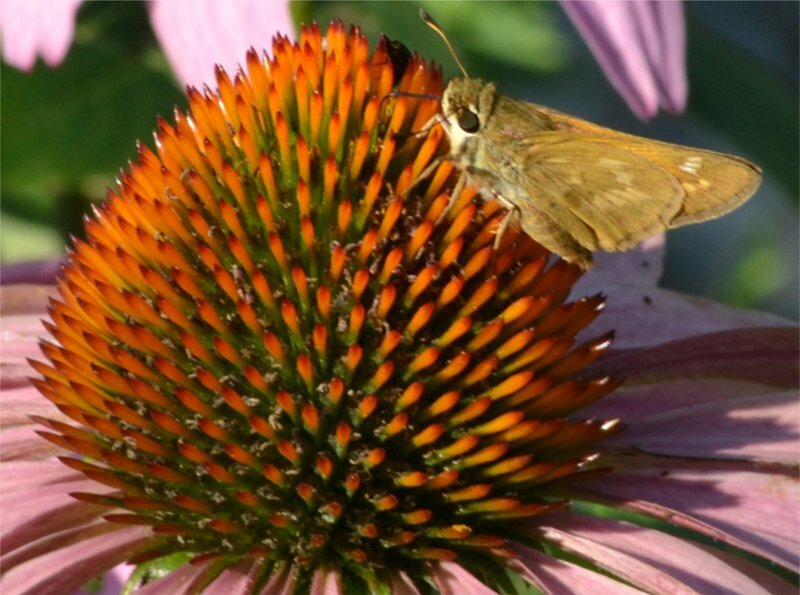 Nectar sources included rudbeckia, spotted knapweed, mountain mint and fleabane. 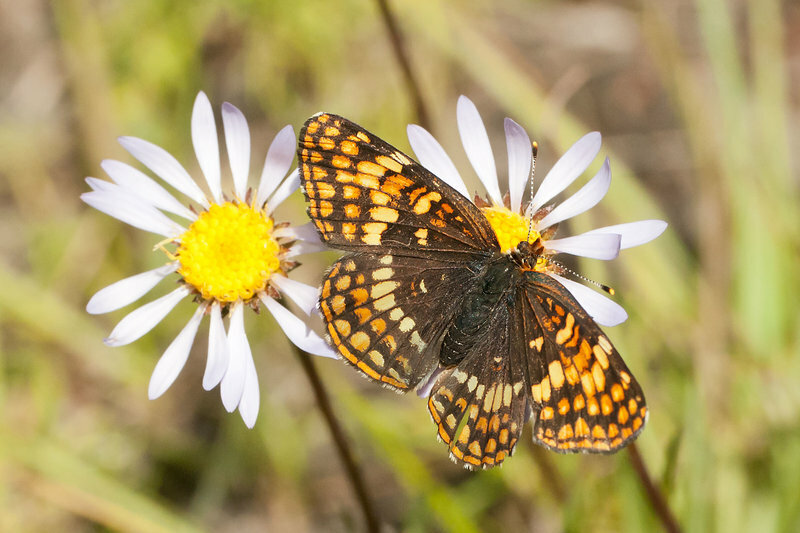 Notable sightings included abundant Silvery Checkerspot and large numbers of Red-spotted Purple. 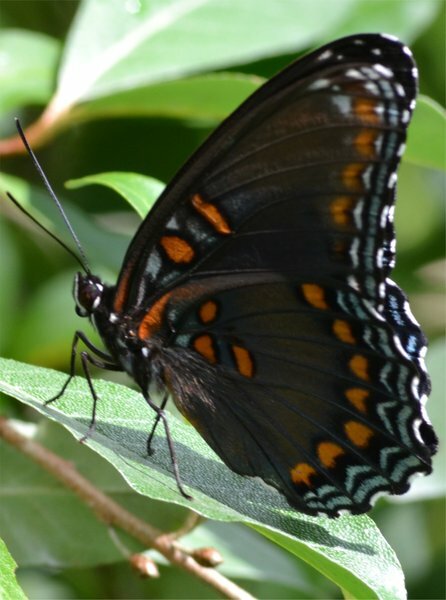 sunny and warm mid to upper 80s, most species were seen at the butterfly and youth gardens.tail-less female zebra swallowtail was laying eggs on the upper surface of Paw Paw leaves. 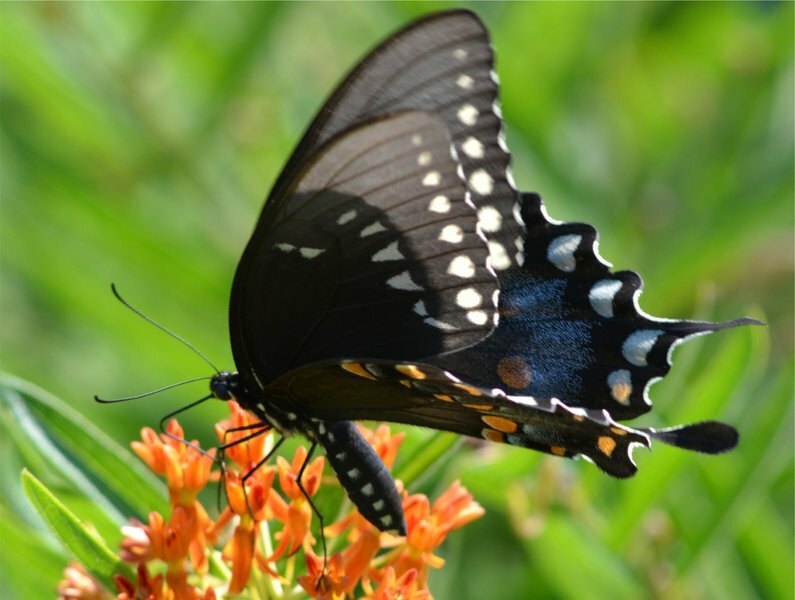 Pipevine swallowtails were by the trellised pipevine. 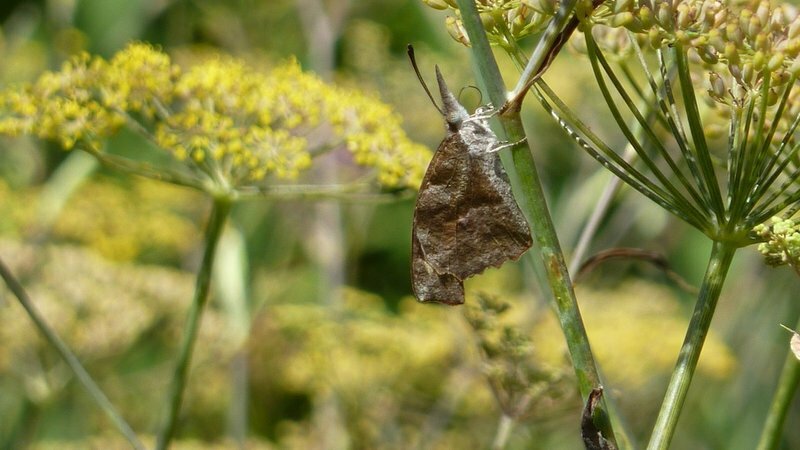 This was the 2nd NABA Butterfly Count held at the refuge. 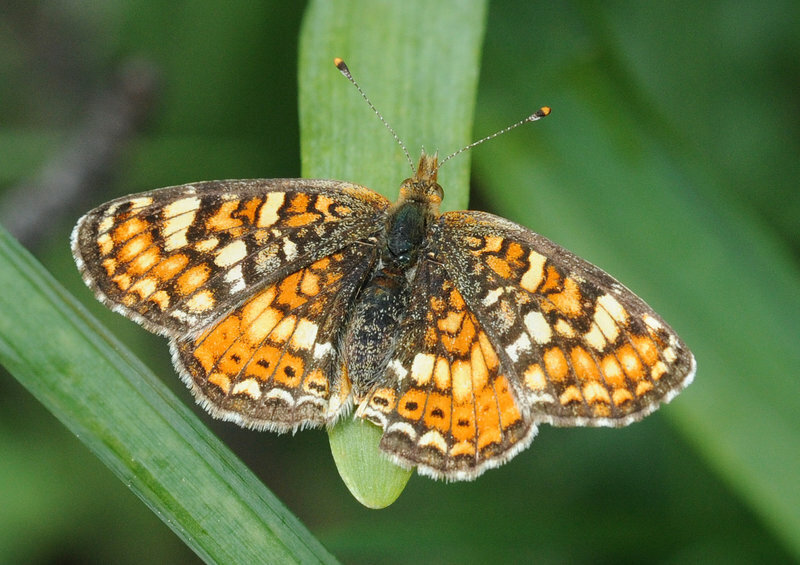 There was a total of 19 species recorded, off 2 species from last year count. 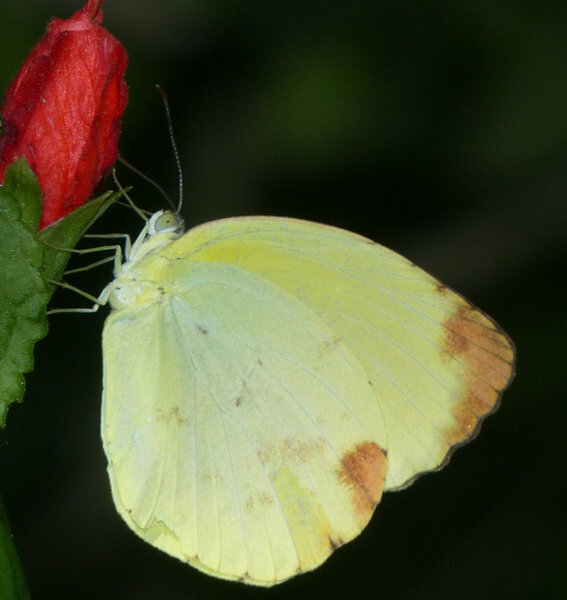 One new species was recorded the Cloudless Sulphur. 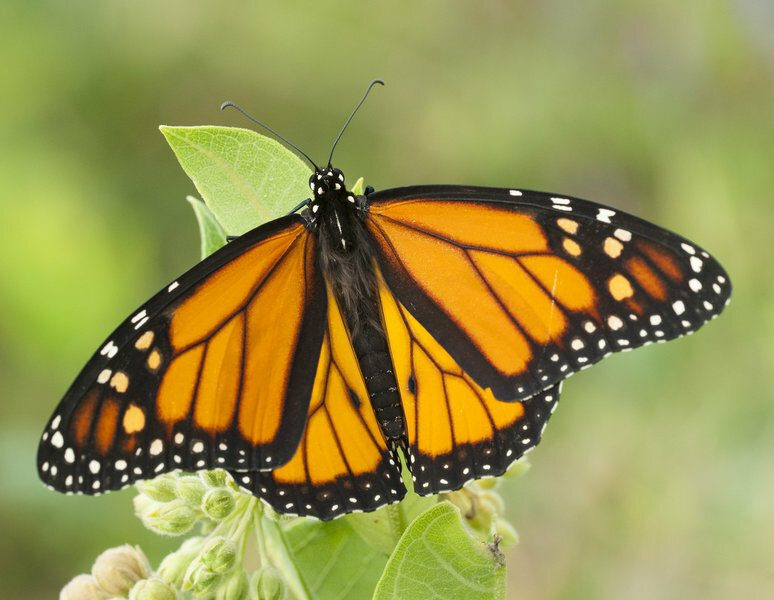 No Monarchs were observed flying but several eggs and cats were seen on the local milkweed. This was the third area that Jim Springer and I walked for the Bowman’s Hill Wildflower Preserve Count Circle. 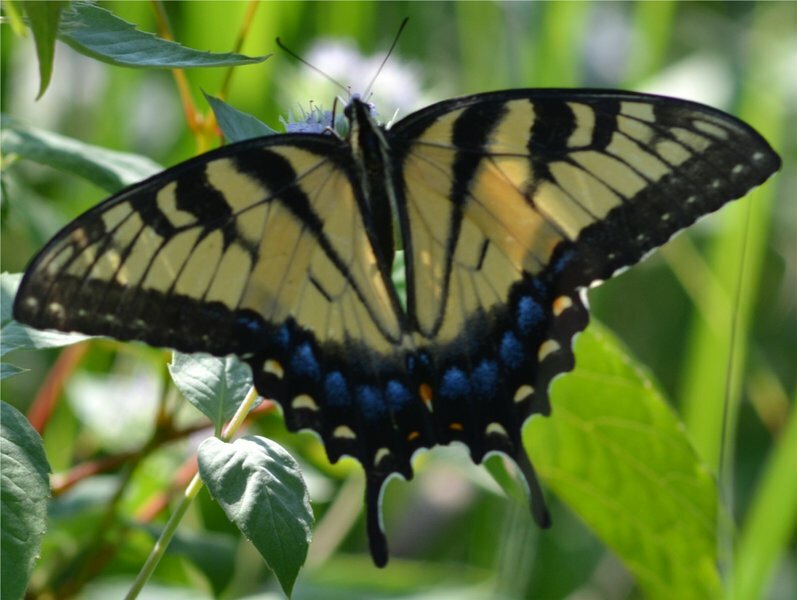 It was my favorite of the three areas last year because of ample nectar sources and lots of large butterflies (particularly swallowtails and monarchs). 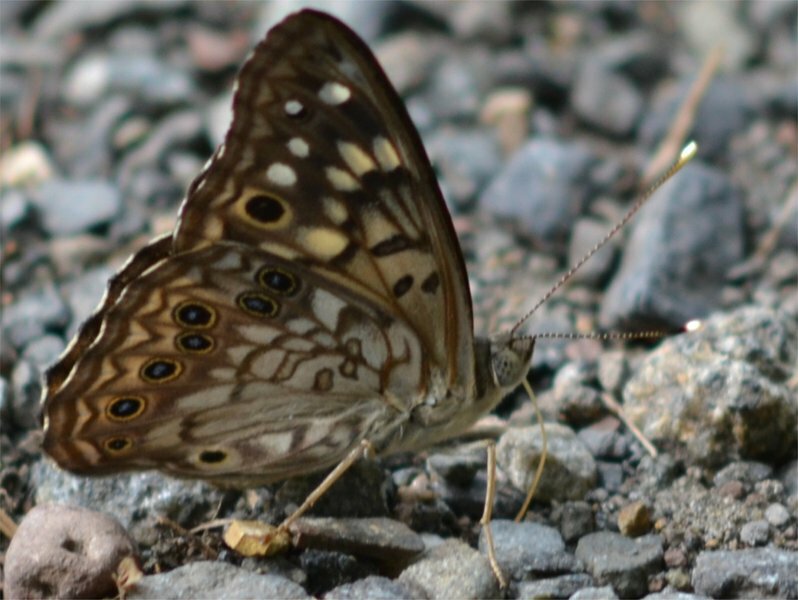 We tried to get the Hunterdon Land Trust group to consider butterflying this area, but I believe that it is technically not a part of their holdings, so Jim and I had a quick bite of lunch and proceeded to start butterflying. 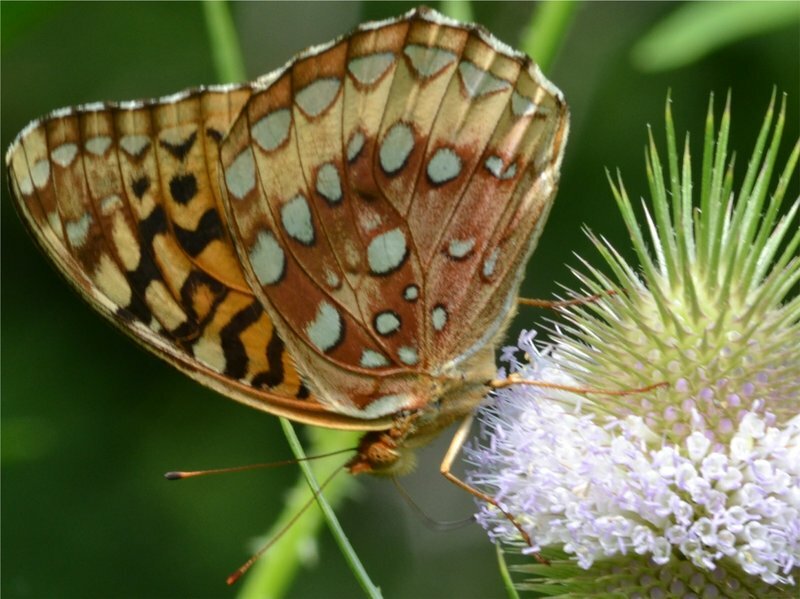 There were literally dozens of butterflies on several nectar sources (particularly Teasel) right up on the edge of the parking lot. There were enough that I just had Jim start calling them out and I wrote them down. 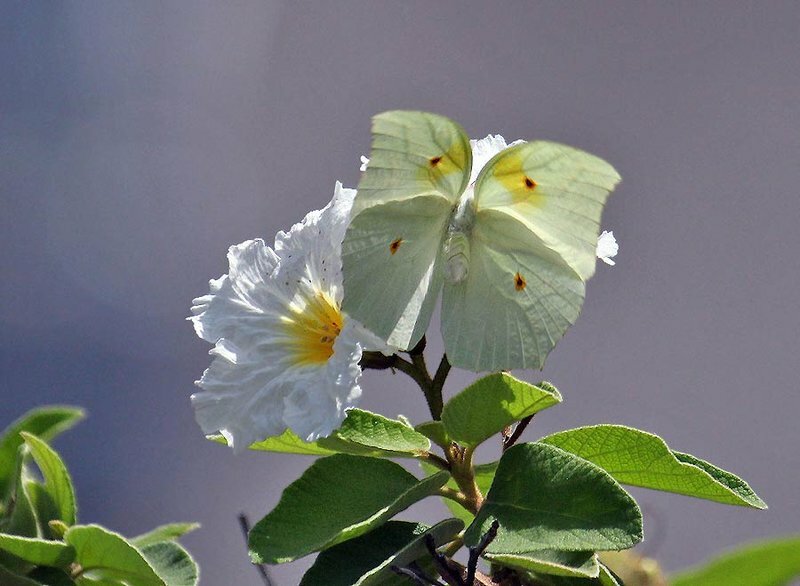 There was too little time for any really good pictures in the early going, because there were so many butterflies clustered at the parking lot. We had only about 45 minutes to cover the area, which was the smallest of the day. Weather: 88-86 °F, calm, mostly sunny. 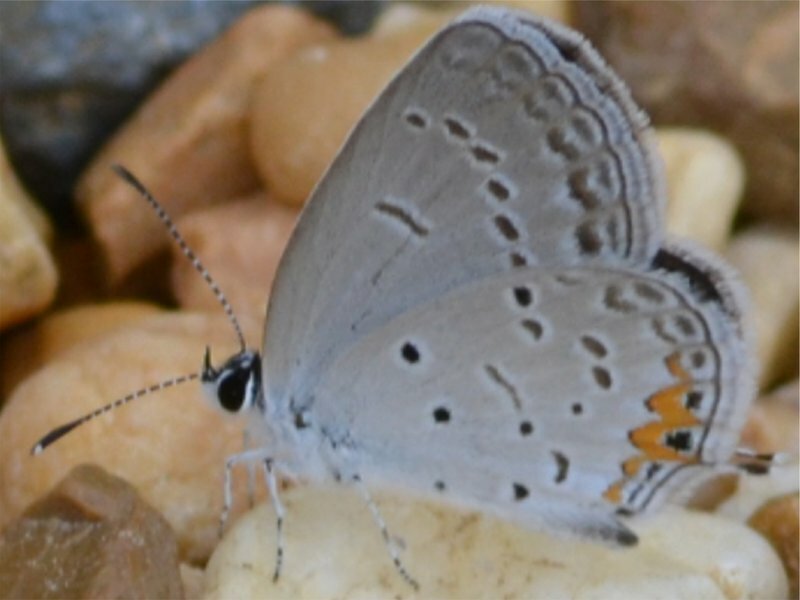 Habitat: clay-dirt service roads and grassy paths through oak-hickory forest, second-growth, meadows, hayfields, creeks, and row-crop fields (all on public land). 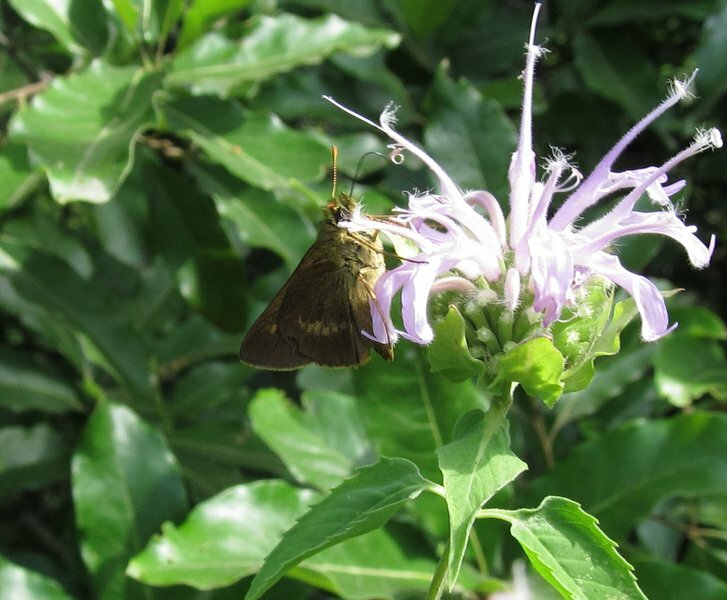 Monarda fistulosa and Pycnanthemum were the most heavily visited nectaring plants. 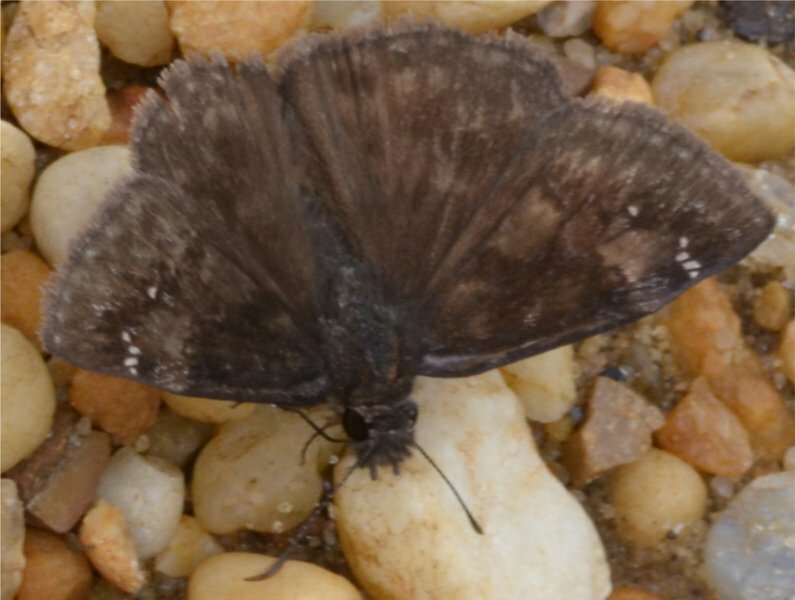 Notes: The photographed Horace’s Duskywing oviposited repeatedly on Quercus seedlings. Among the Great Spangleds, I saw a range from extremely worn to very fresh-looking individuals. 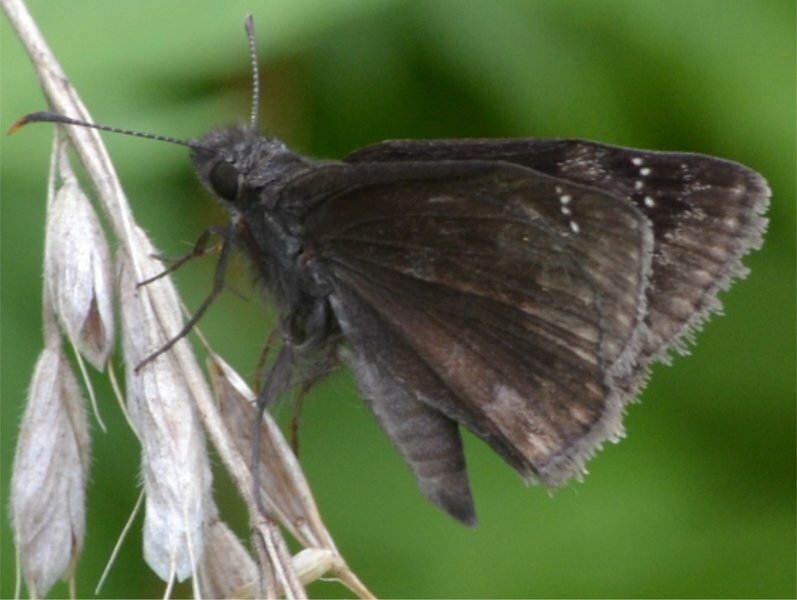 The 24 for Little Wood-Satyr is much greater than I’d normally expect so far into July. 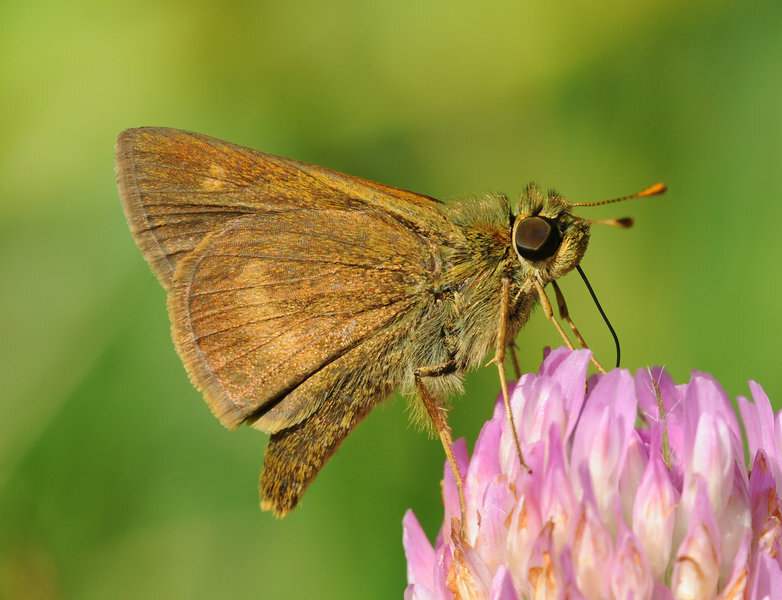 The Bronze Copper represents an unusual occurrence for this site, although the species is found reliably elsewhere in southern IA. Jim Springer and I led a group from the Hunterdon Land Trust (HLT) on part of the Bowman’s Hill Wildflower Preserve Count Circle. This is the second year of the count and this area was the least productive area from last year, but this year, we were almost immediately greeted by a Hackberry emperor, which puddled in the parking lot and posed for several pictures while we waited for the HLT group (which administers the Preserve) to join us. 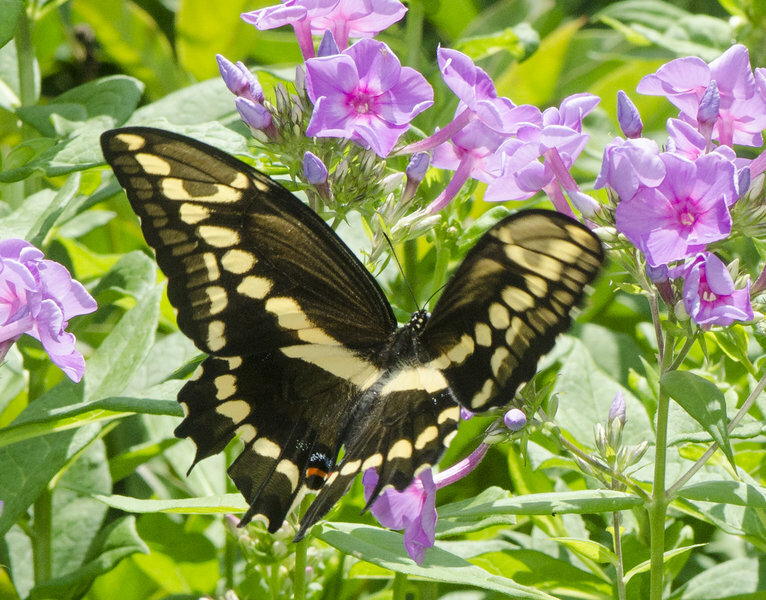 Jim Springer followed a mysterious black-colored swallowtail that seemed to vanish, but it vanished near the creek where he observed 7 puddling Eastern Tiger Swallowtails! Everyone showed up around 10 to start the count, which we conducted for about 45 minutes before moving on to the next HLT location. This area (40.42916667, -75.01972222) was the second area Jim Springer and I covered, working with the Hunterdon Land Trust (HLT) group in the Bowman’s Hill Wildflower Count Circle. It is the larger of the two properties we observed and we dedicated an hour and a quarter to walking the edges of several fields that were farm fields until recently. In the parking area, there was an old-field succession that had been planted in Timothy grass in 2012. 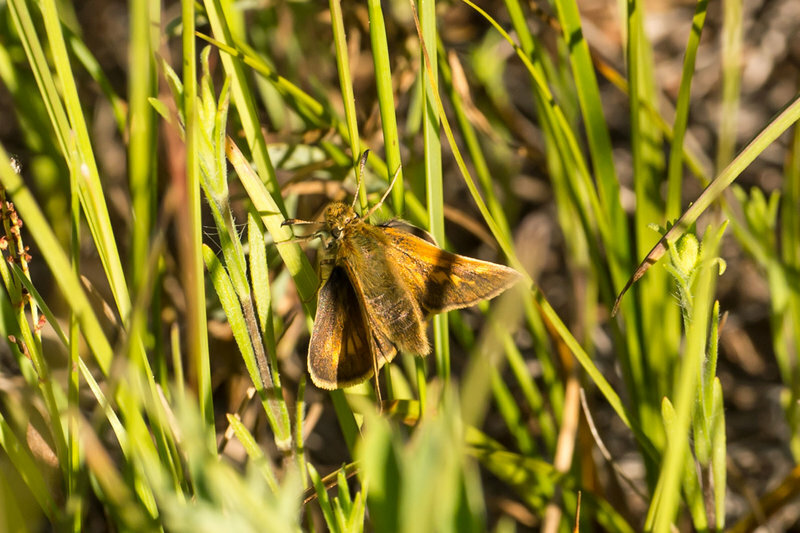 Jim pointed out to the group that the abundance of Timothy grass remaining would make this a prime location for European skippers (though we are about 3 weeks to a month late) and it would be good to check the location next year in early June. We split the group at the halfway point, I split off to cover the less productive areas while sending the rest of the group to the fields I did not cover last year, that looked more interesting this year. There were several stands of milkweed, but I could not find a single monarch caterpillar. 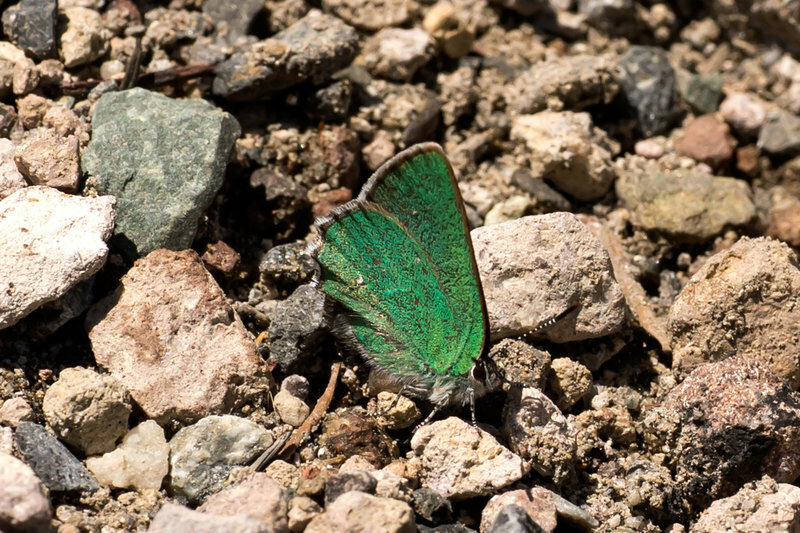 I did, however find a very cooperative Juniper Hairstreak and Jim found a Broad-wing skipper (two of the seven NABA had targeted as missing photos for Hunterdon County after 2000. 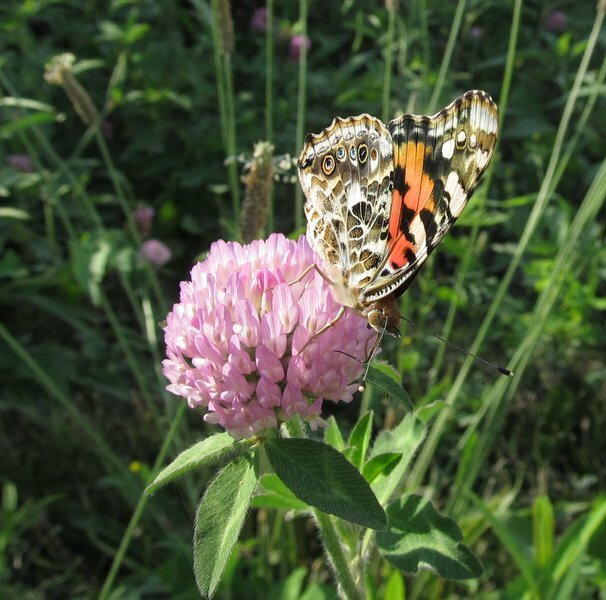 The extra people helped to find more butterflies than we had here last year and a better diversity. This was the fifth area (40.49777778, -75.04361111) I covered with Jim Springer. 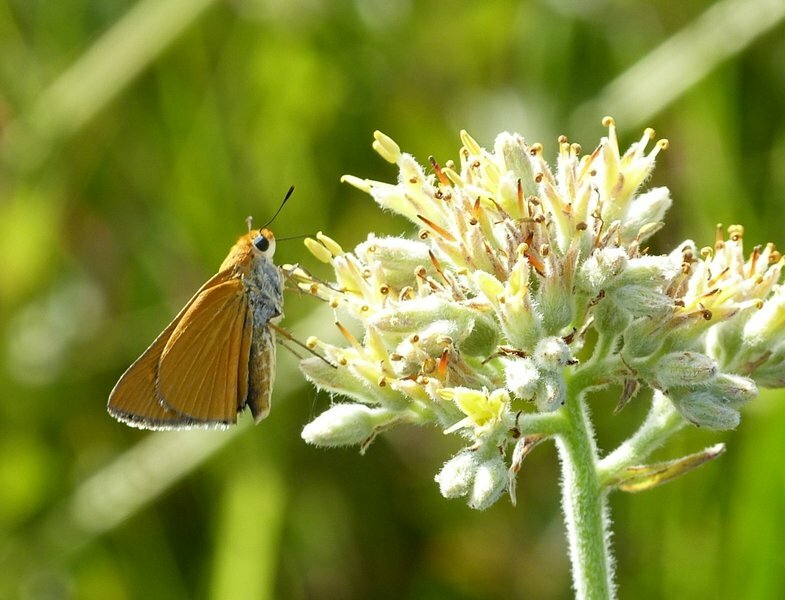 We were again joined by Chris & Paula Williams and were pleasantly surprised by the extent of the fields and the numbers of butterflies and nectar plants. It would have been easy to put several other butterfliers in the fields - there was too much area for the four of us to cover in one hour. We concentrated on two adjacent fields near the parking lot, splitting up and going in slightly different directions (I wandered between the others to keep the tallies up-to-date). 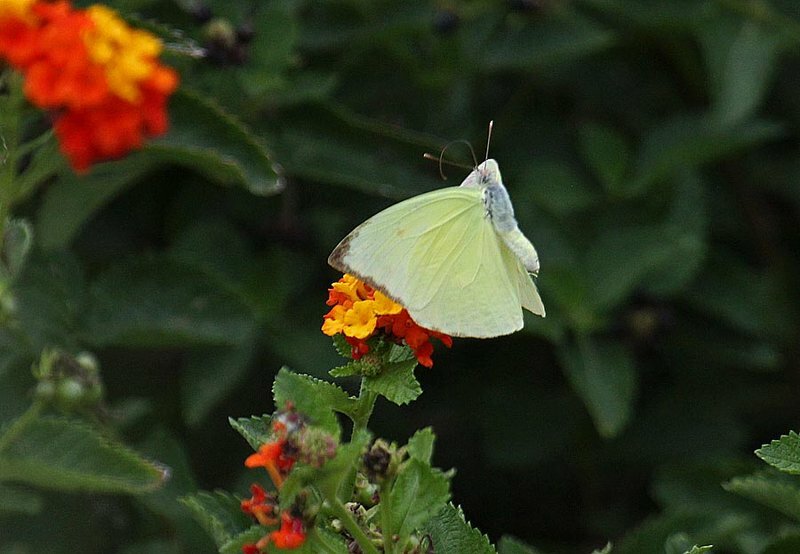 It turned out to be the place with the most non-Cabbage white butterfly individuals and the highest overall diversity of the places covered. 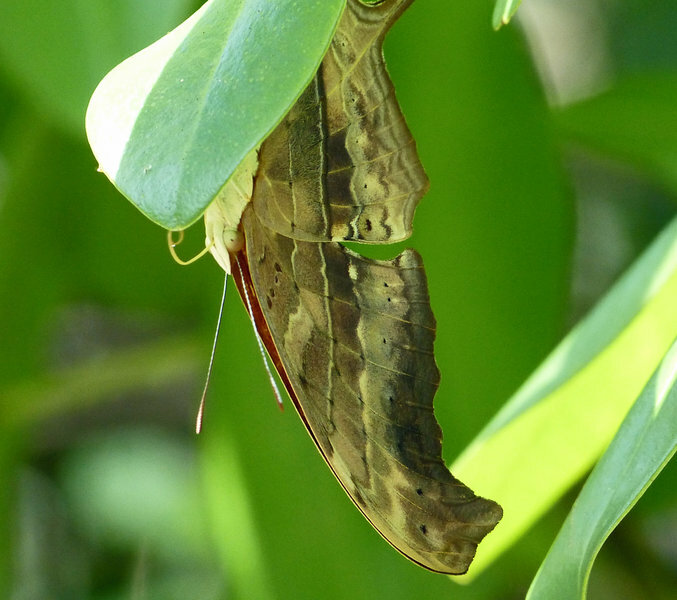 Brief lepping visit at Butterfly Garden around the main office, between 12.30 and 1pm. 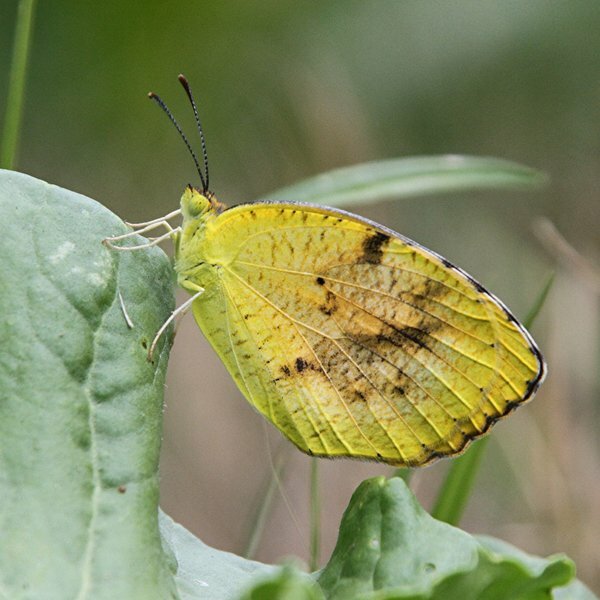 Rather few leps, but best find was a female Statira Sulphur - see photos. 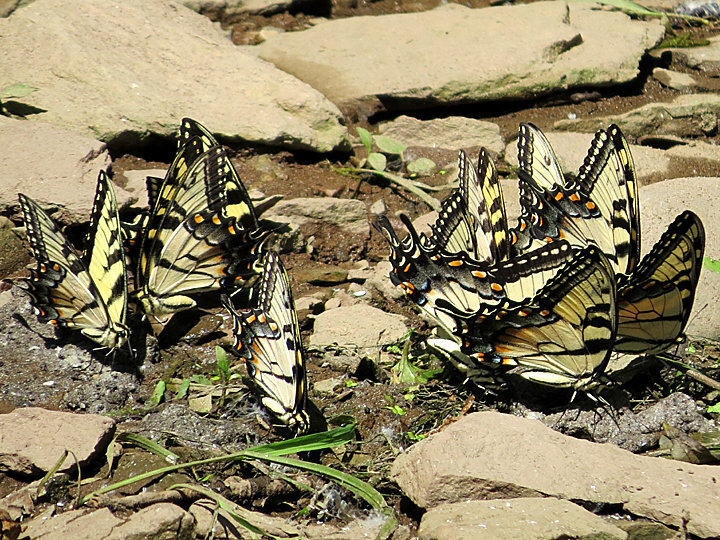 Uncommon to see this many Eastern Tiger Swallowtails in my backyard simultaneously. Cuddy park meadow, Lower Frederick Twp. We walked the road and trails on the outer grounds and around the pond from opening to noon. All of the Sleepy Orange were seen near the pond. 2 fresh, 2 worn. One female on and around host but not observed oviposting. Several nests of what seemed to be Balimore Checkerspot larva which were visible by binocular or camera lens seen on was probably some sickly looking turtlehead. 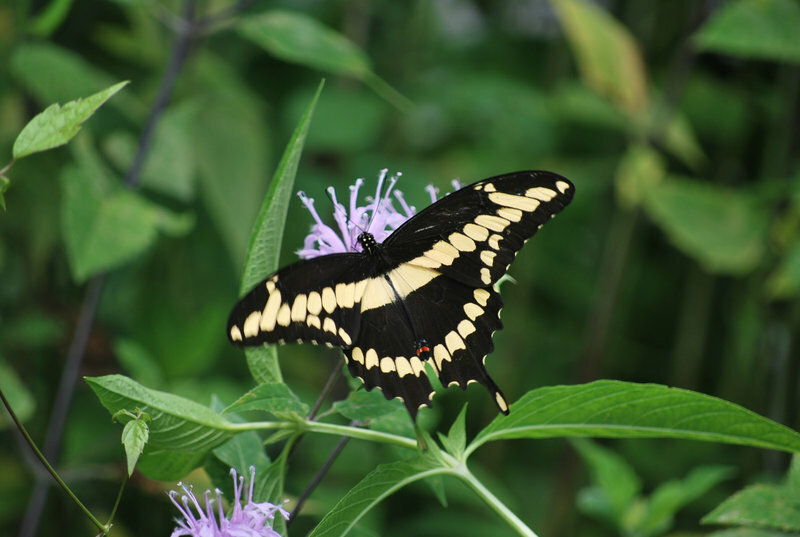 Many hundreds of eastern tiger swallowtails in patches of beebalm. Our team of 4 as part of the Corkscrew Swamp Sanctuary NABA count. Linda Beaudine, Buck Cooper, Linda Cooper, Jean McCollom. 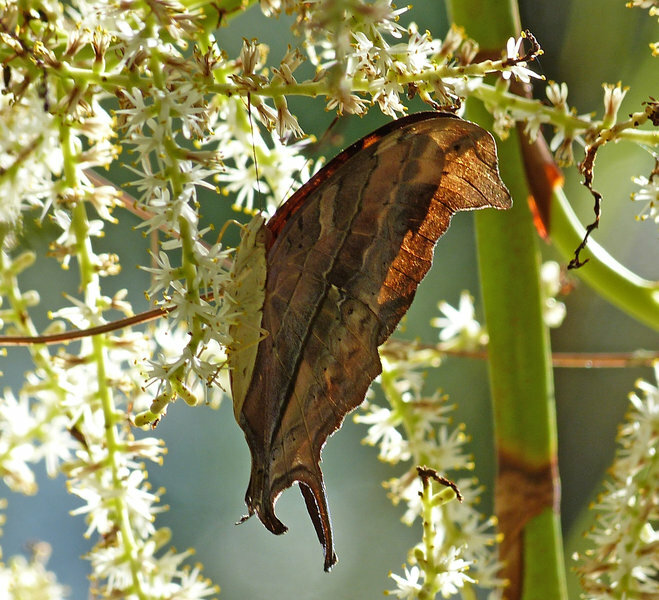 It seemed every Cabbage Palm blossom (Sabal palmetto) had Ruddy Daggerwings nectaring or hiding under their host plant leaves - Ficus. 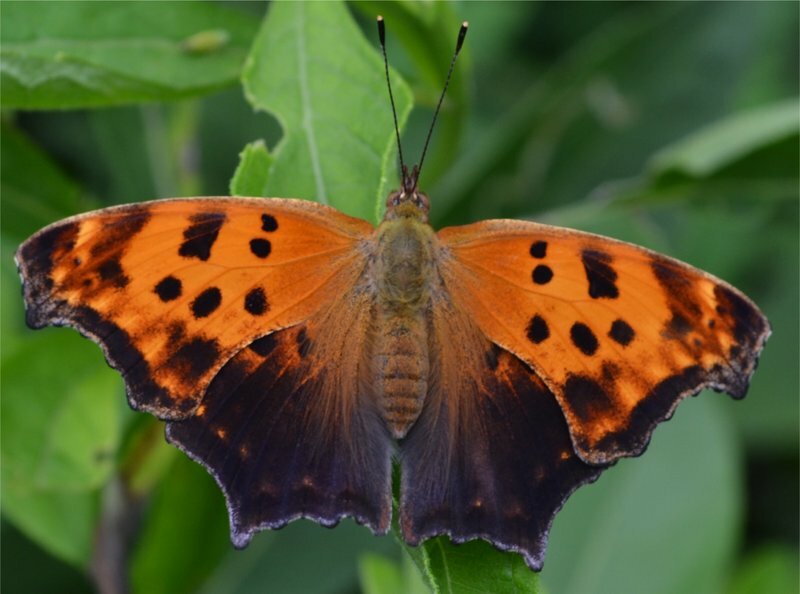 I had checked this area (40.342090, -74.941403) out last year to see whether there might have been some chance for Sleepy orange butterflies at the same latitude as the Bowman’s Hill Wildflower Preserve, but across the Delaware River in NJ. 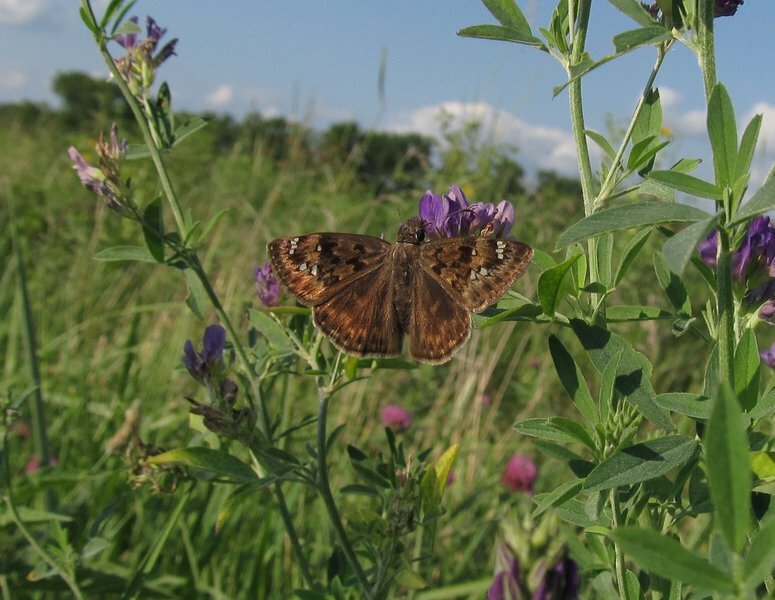 There is a large area of old-field lands that had a decent amount of milkweed and dogbane, among other species of nectar plants in these fields, but there were few butterflies when Jim Springer and I checked it out last year. 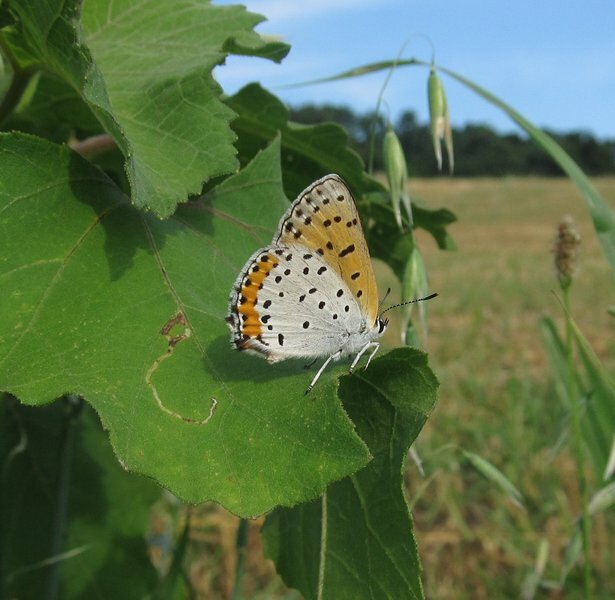 This year, a great deal more vegetation is in the northern end of the fields, but the ring of trees surrounding the fields (and/or a mowing) has resulted in later-blooming milkweed and dogbane in the southern portion of the field, supporting a large number of big butterflies. 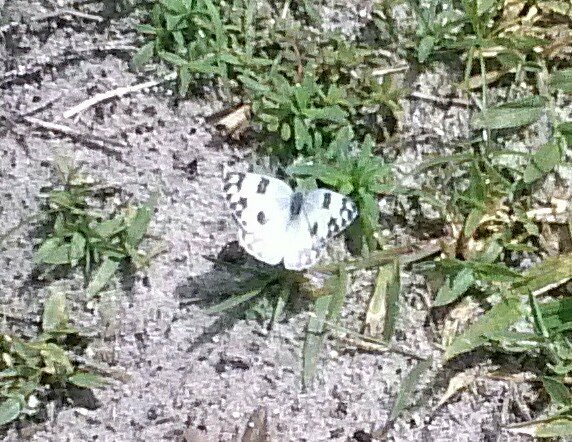 I spent an hour and a half walking around the northern portion of the field and saw a lot of butterflies. Weather was cool (65 to 72 degrees) during time spent (Noon-3pm) and wind was steady & breezy (10-15mph). 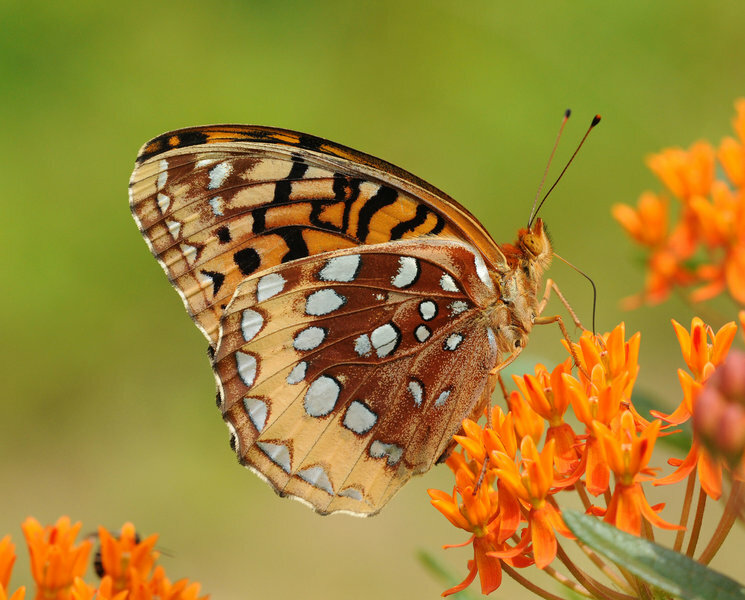 A great deal of the butterflies were hunkered down on milkweed or burried in deep grass. Challenging! 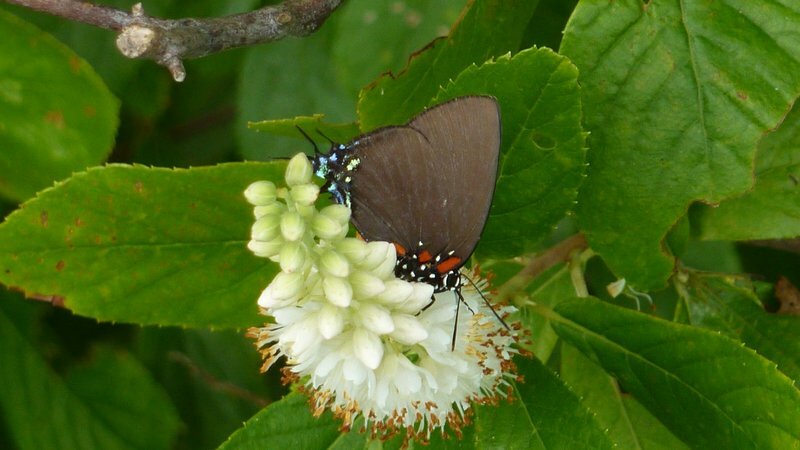 This was the first time I have ever seen 6 species of hairstreaks at one site in WI. 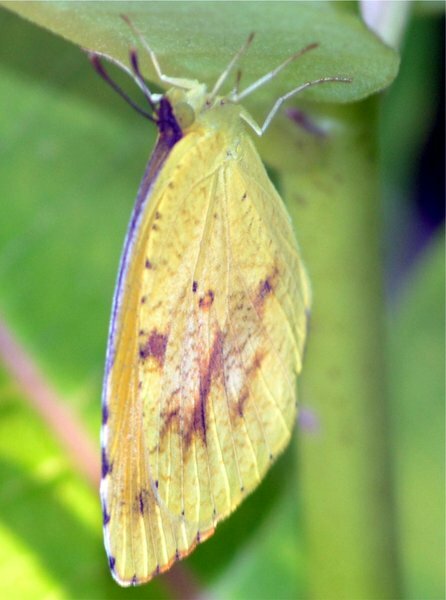 Dina Yellows are a scarce stray in south Texas and this was a Life photograph for me. 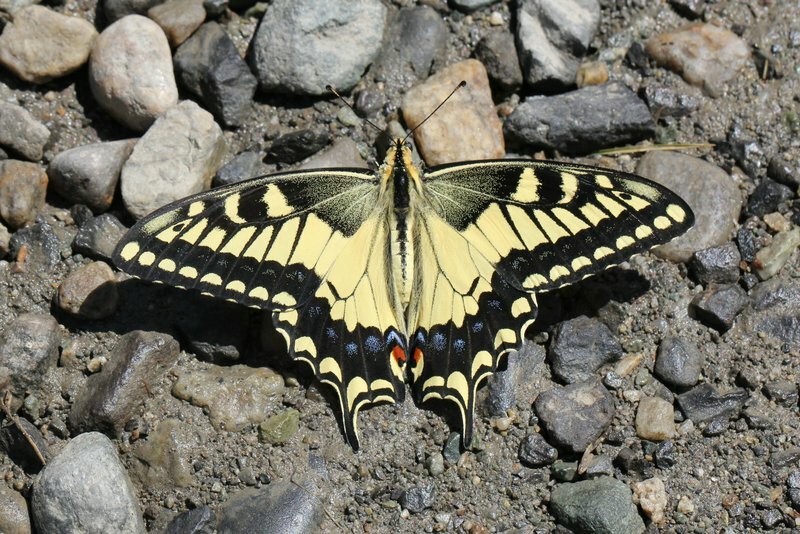 Tiger Swallowtails puddling in the canal bed. Just thought it was interesting. lepping from c. 11am until 1pm. Generally very slow, with few individuals seen. 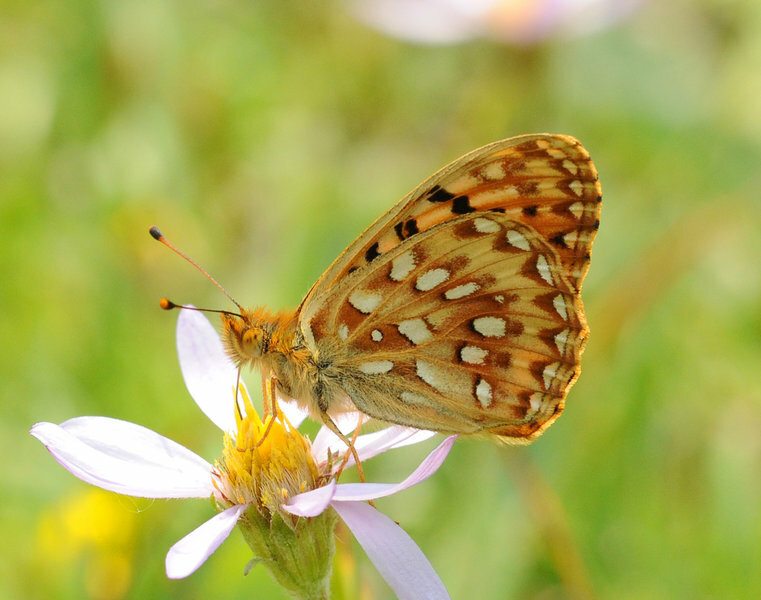 Most of the natural area had very few flowers, while much of the planted areas had quite a few lep-friendy flowers - but still very few butterflies. Weather hot and partly sunny. Hour-and-a-half walk, about 10:15–11:45 a.m. 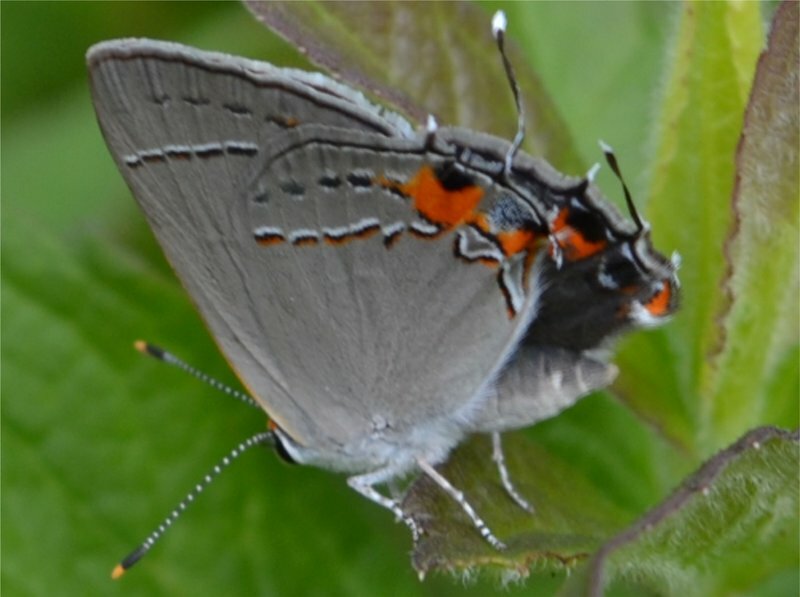 Known location for King’s Hairstreak, which feeds on the (relatively) abundant sweetleaf (Symplocus) in the adjacent wet forest and swampland. Very early visit, 8:30 am under light clouds and cool (low 70s F) temperatures. Heavy dew. Sun broke out at approximately 8:45 am. 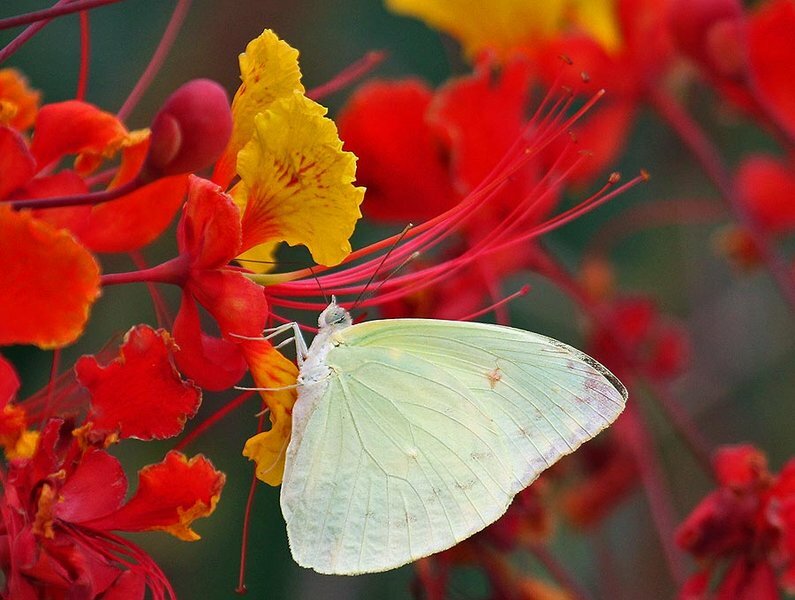 Few or no nectar sources available. In the field for approximately one hour. About three hours at midday exploring Hickory Point Road near Pocomoke City, MD. Warm (about 80F), mostly sunny, light breeze, dry. Abundant Clethra, hibiscus, dogbane and a few swamp milkweeds. The swamp locally supports redbay, the Palamedes larval host. The 8 Bronze Coppers represent the highest one-day total ever in Tennessee, previous number was 3. These results are from the Lower Hatchie NABA count. 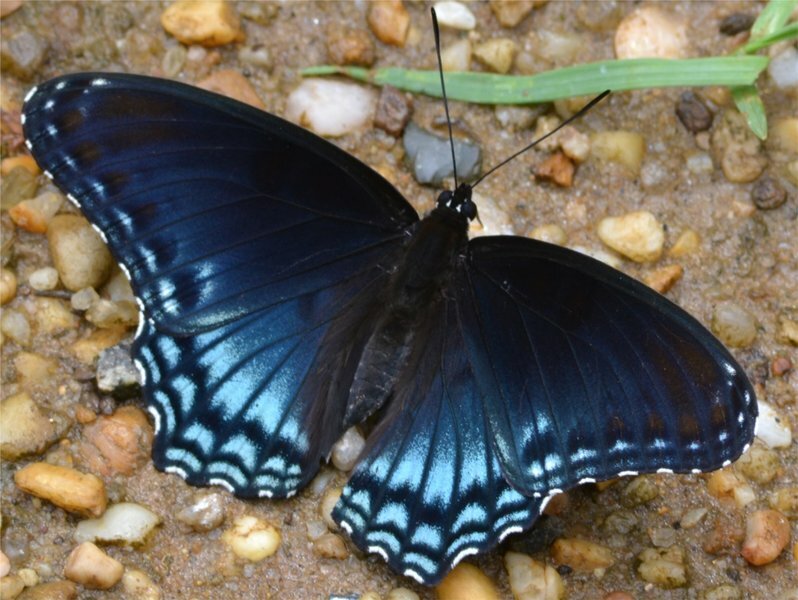 Cool, 55-64 degrees, and mostly cloudy made for a tough butterfly day. 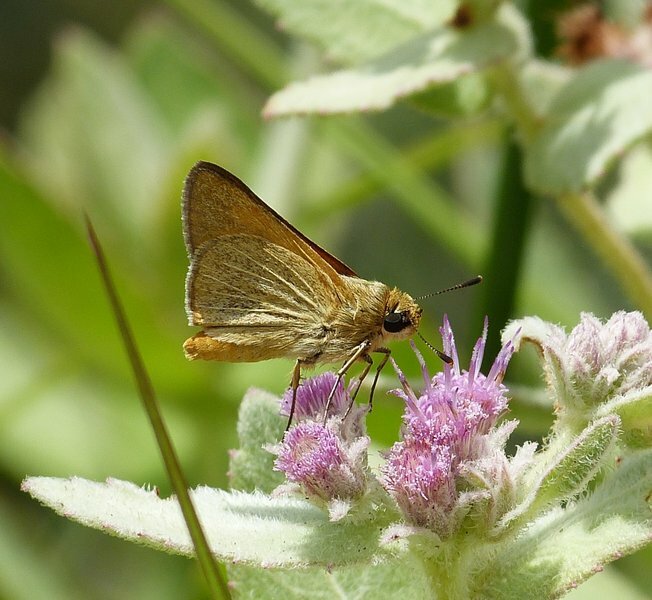 This was only my second sighting of an East-Mexican White Skipper, the first being in 2008. A stray or two is reported most years in the LRGV. 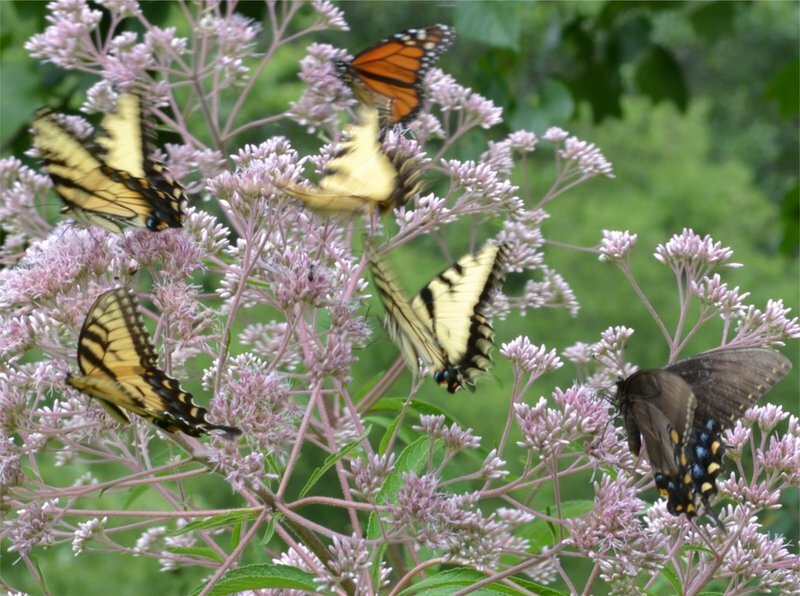 Three hours in midafternoon at this remarkably productive butterfly garden. Sunny, light breeze, 88F. 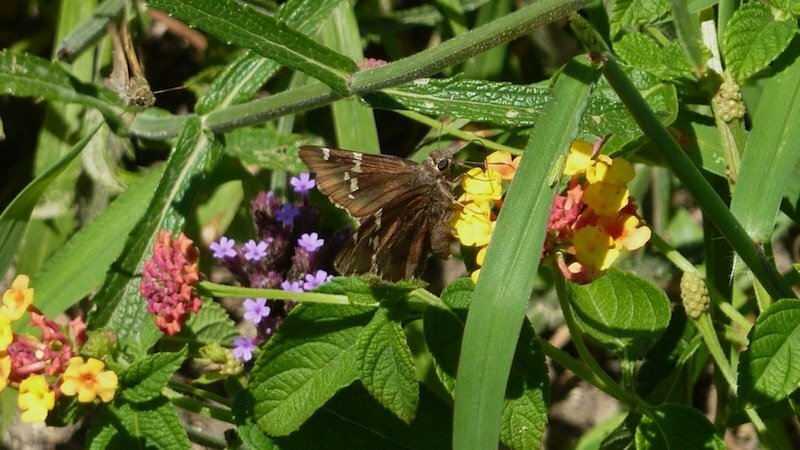 A number of nectar plants; most heavily used were zinnia, lantana, swamp milkweed and Verbena bonariensis. Solo trip. 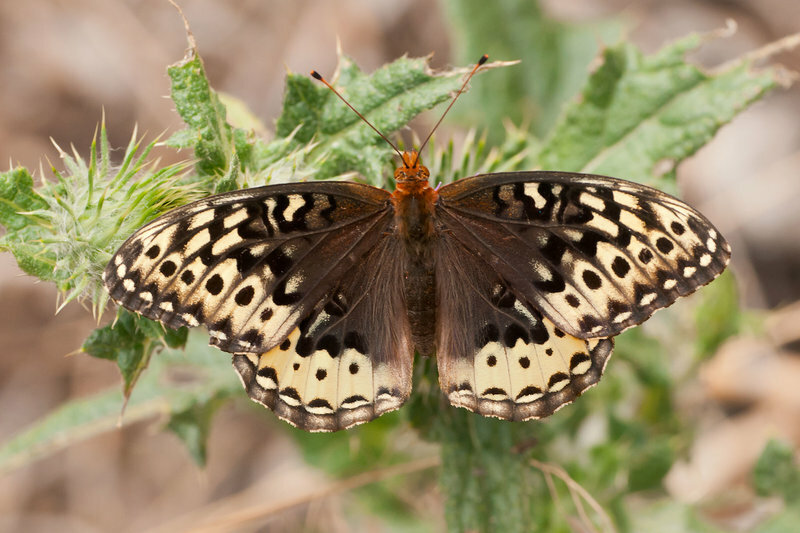 A small part of the Yosemite National Park NABA 4th of July Butterfly Count. Only species and numbers that I saw are reported. This site requires a 45 minute climb up a scree slope. 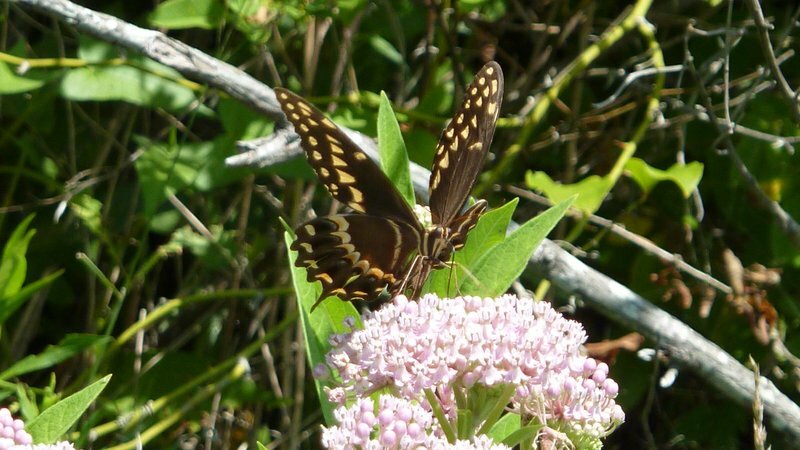 A small part of the Yosemite National Park NABA 4th of July Butterfly Count. Only species and numbers that I saw are reported. 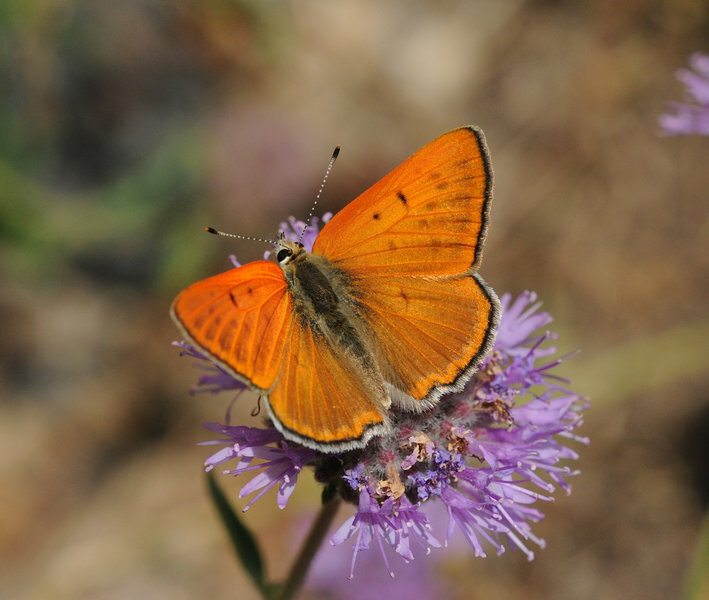 California Crescents were associated with thistles. 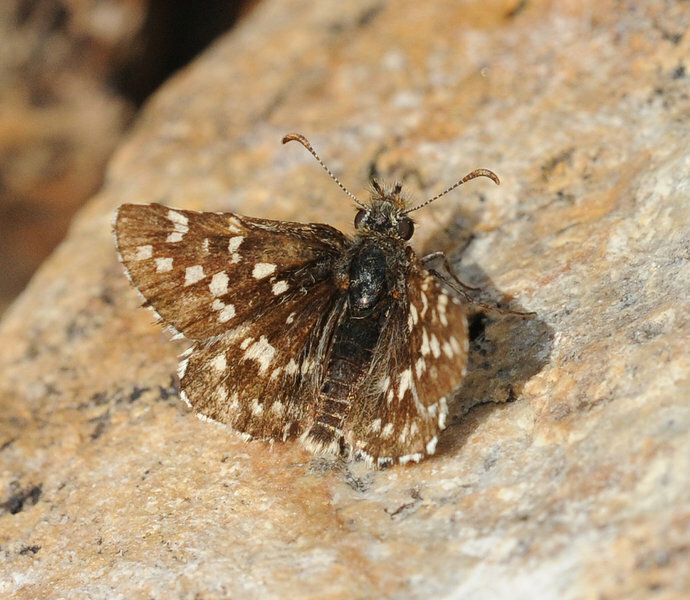 Two-banded Checkered-Skipper was on a rockslide and late. Where Highway 39 crosses Big Sheep Creek in the Eagle Cap Wilderness. 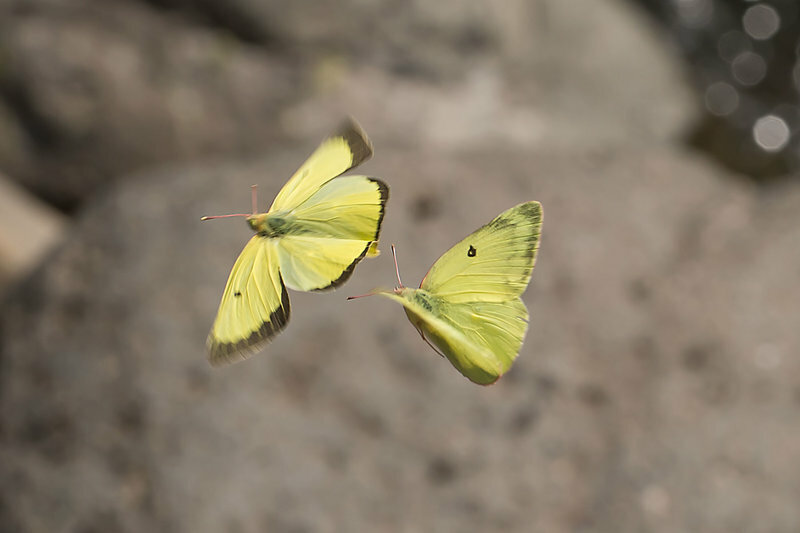 A quick stop yielded about 6 very bright Western Sulphurs. 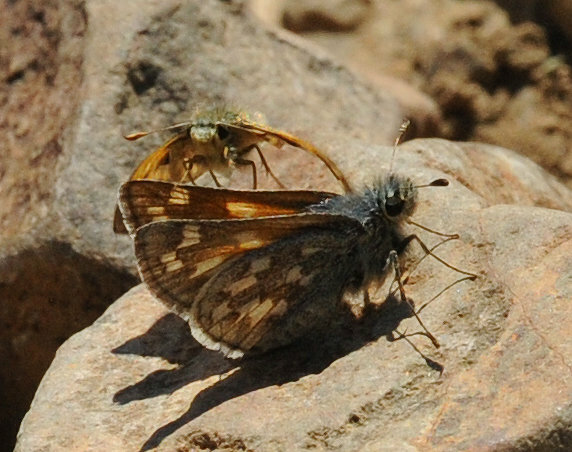 All of the Rockslide Checkerspots and the male and female Sierra Skippers were at the same spot, coming to flowers in the rockslide. 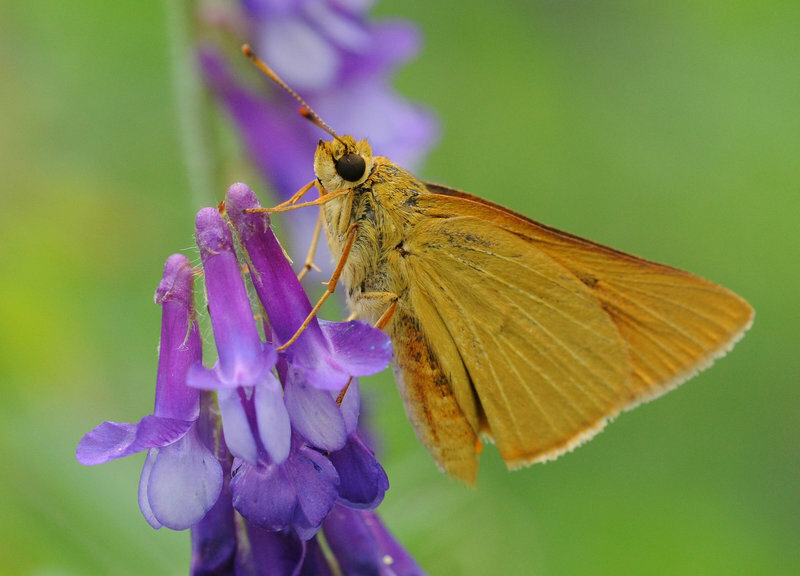 First Fiery Skipper of the year, First Common Buckeye of the year. 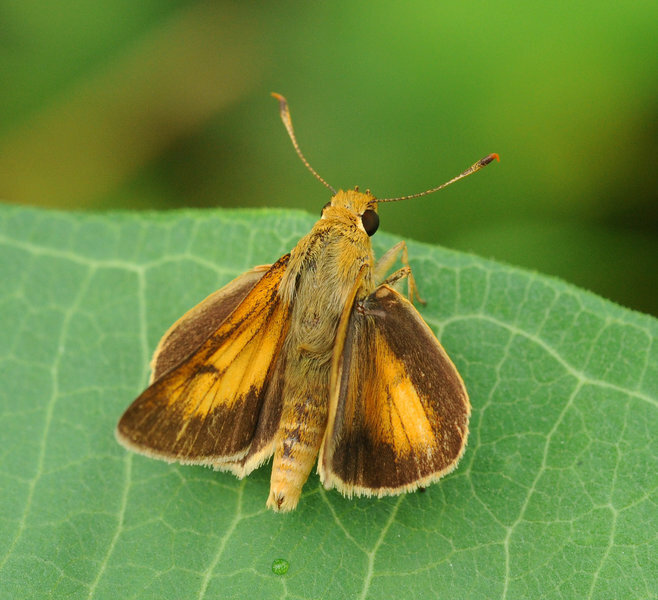 2nd brood of the Zabulon Skippers has emerged. 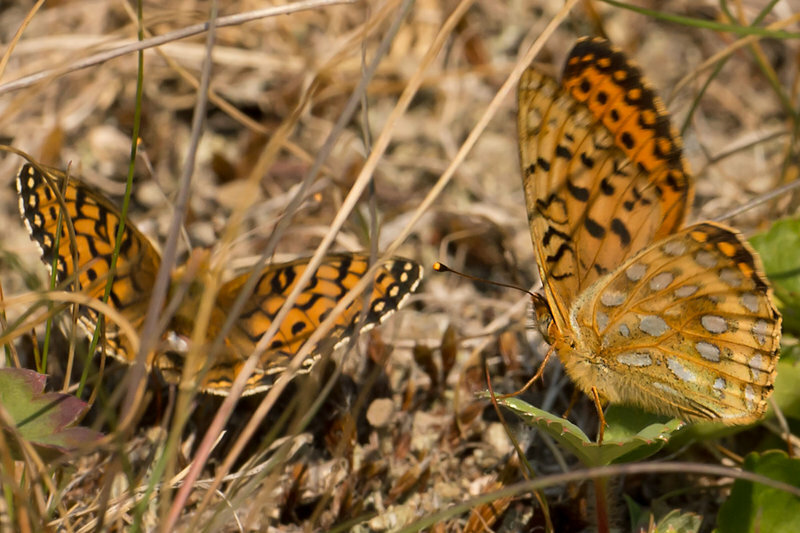 A male Mormon Fritillary was lovesick and following the female through the grass. 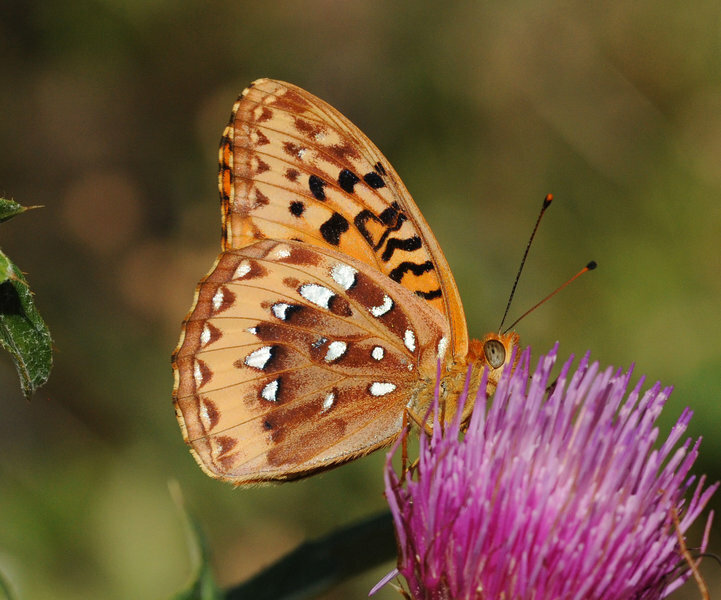 For two years in a row I found a few Great Spangled Fritillaries along the road leading up to Ball Mountain. 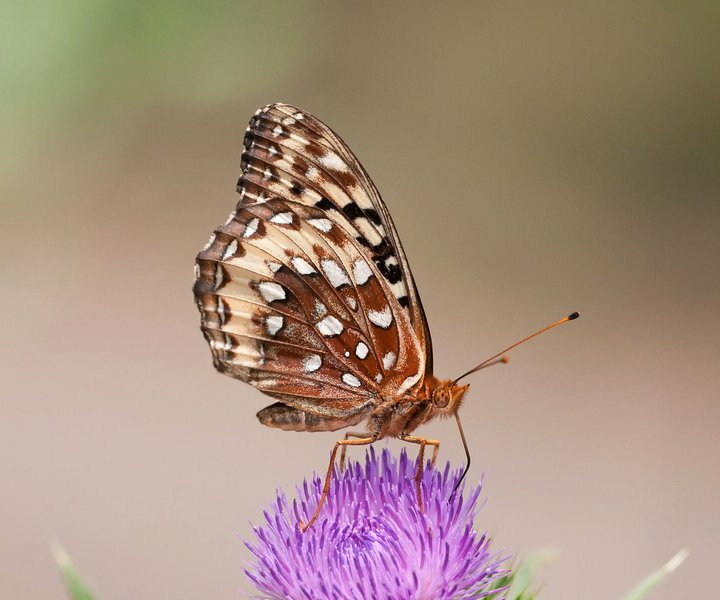 These sightings were in a forested area and I knew that Great Spangled Fritillaries are an obligate wet meadow cruiser, so I went looking for the meadow habitat that these frits were coming from. 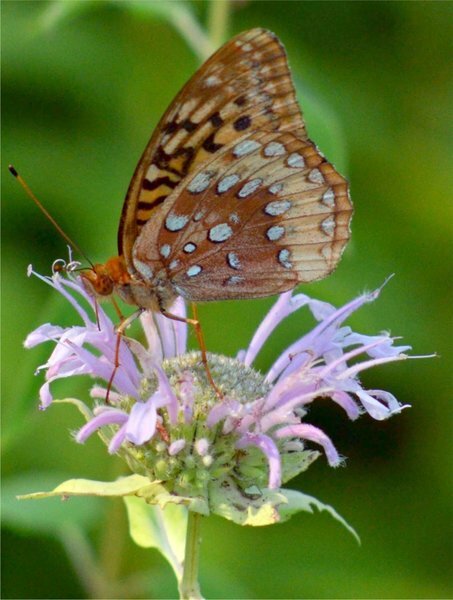 Sure enough the meadows at the base of the climb up to Ball mountain had plenty of thistle hostplant and 18+ Great Spangled frits. 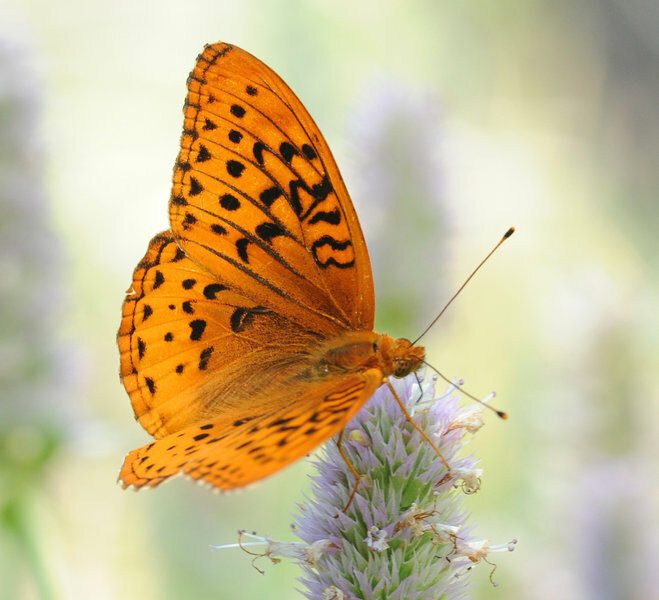 This is a great locale for this wonderful fritillary. Weather: 81-79 °F, partly cloudy to mostly sunny, with light NW winds. 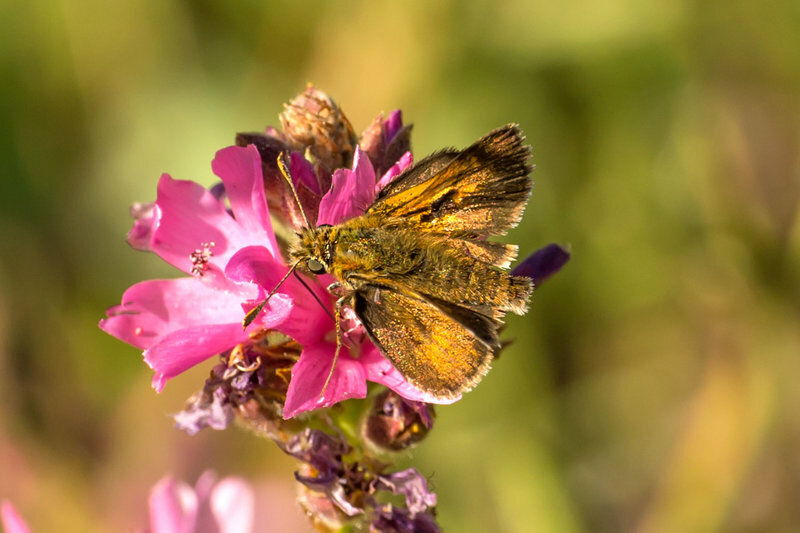 Habitat: woodland borders, second growth, uplands, hayfields, ponds, gravel roads, restored prairie, and floodplain woods/meadows. 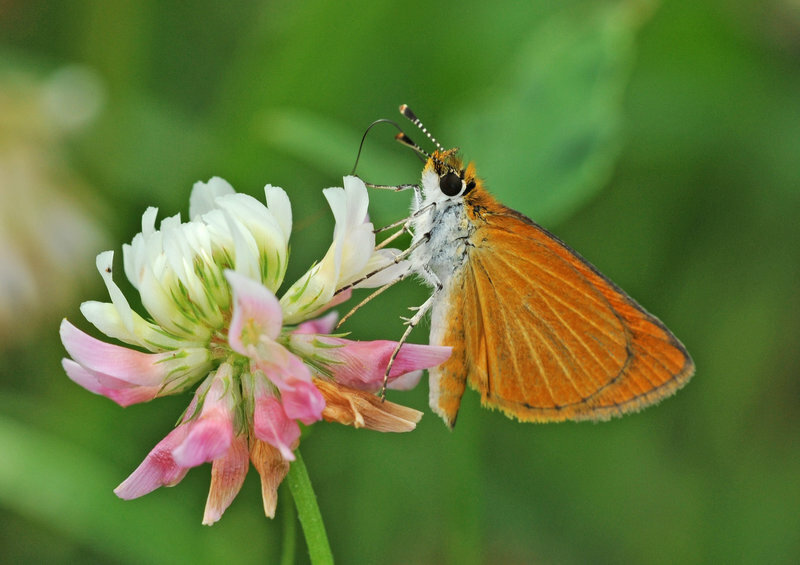 Medicago sativa (along roads), Trifolium pratense, and Monarda fistulosa were the most prevalent and popular nectar sources. 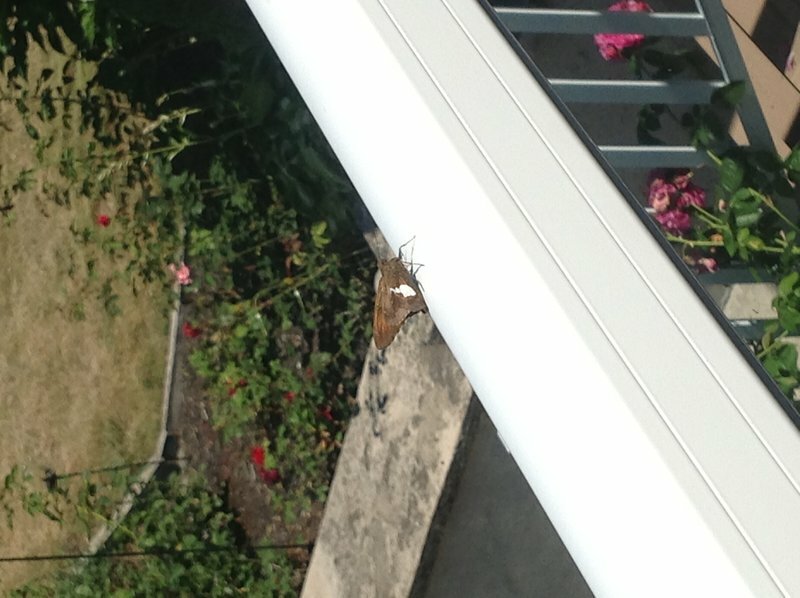 Notes: The Painted Lady was actually my first of the summer. 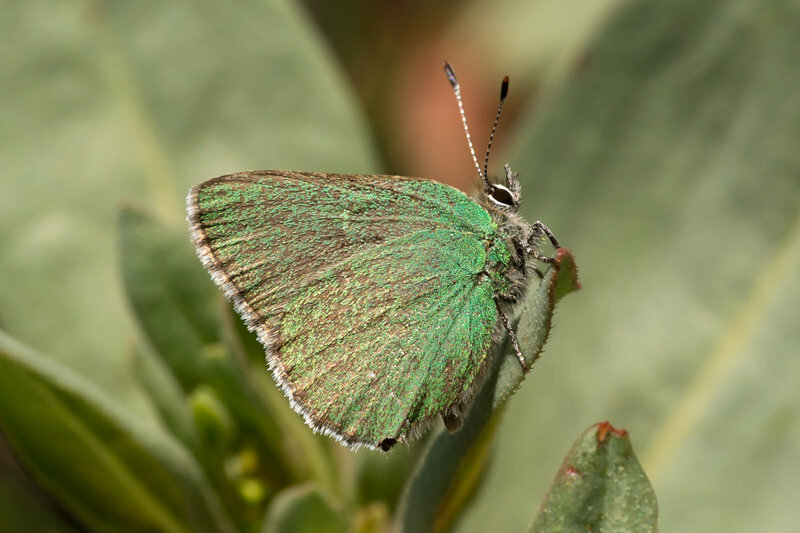 The Juniper Hairstreaks were up fairly high in a Juniperus grove by the SW parking lot. 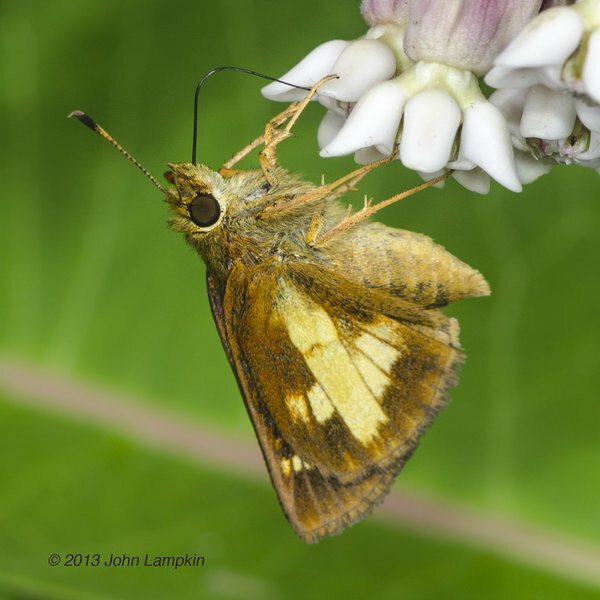 Fiery Skipper and Sachem had recently invaded and were conspicuous in roadside habitats. 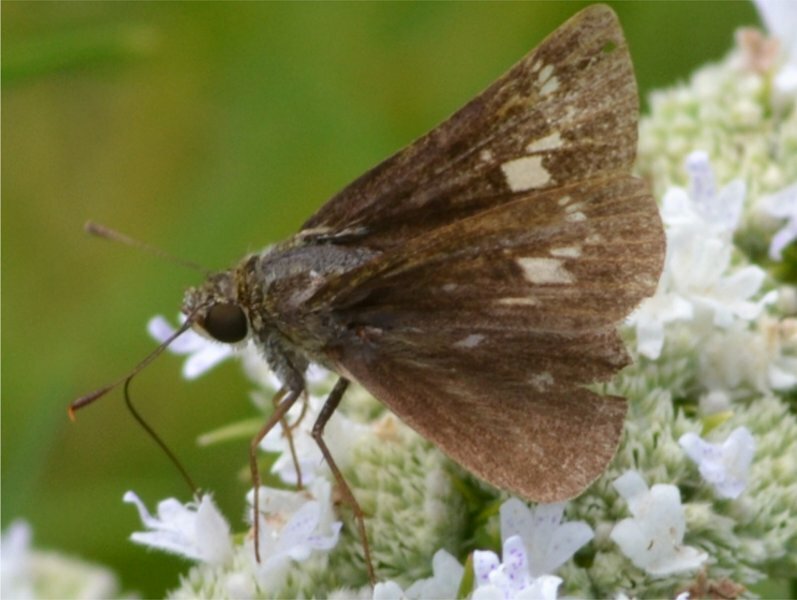 The second brood of Zabulon Skipper was out in full force at dense forest edges. 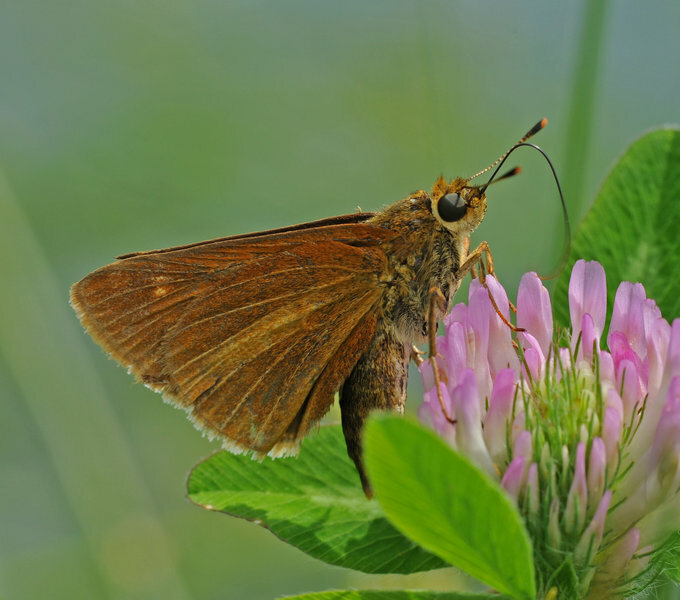 Similarly, as is often the case in late July-Aug in southern IA, fresh-looking Delaware Skippers were perching alertly in meadows.